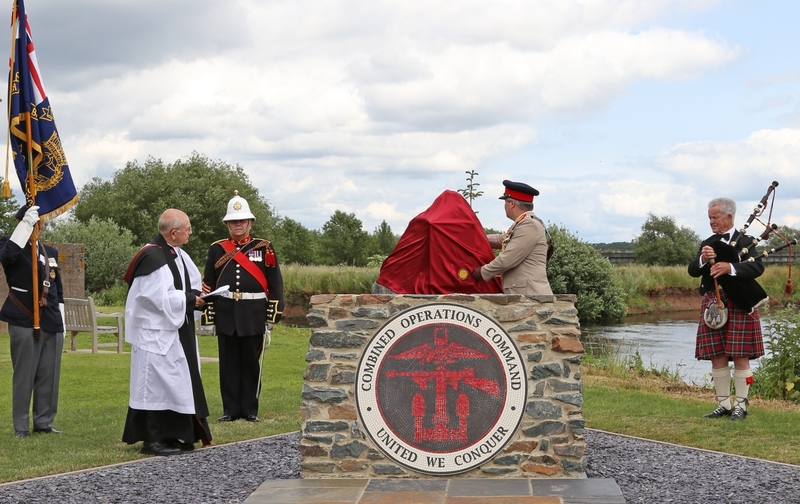 The photos below recount a memorable day of happiness and emotion as the Combined Operations Command Memorial was dedicated. 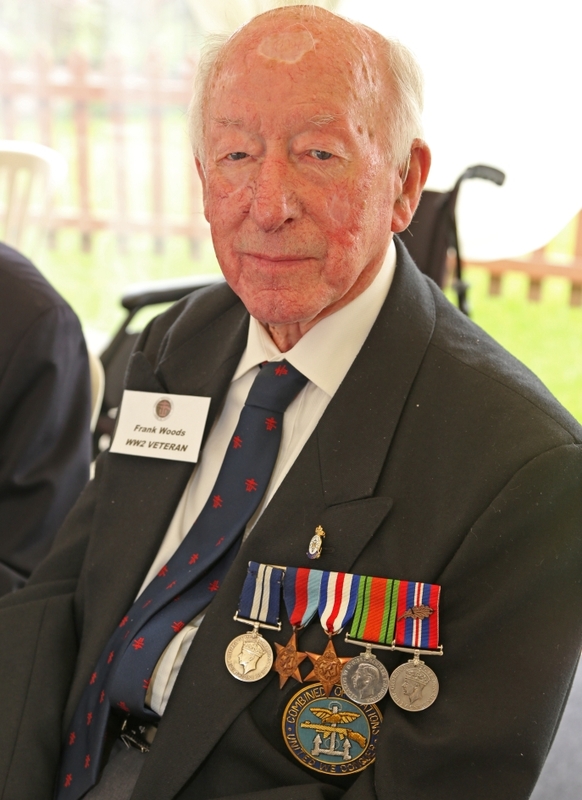 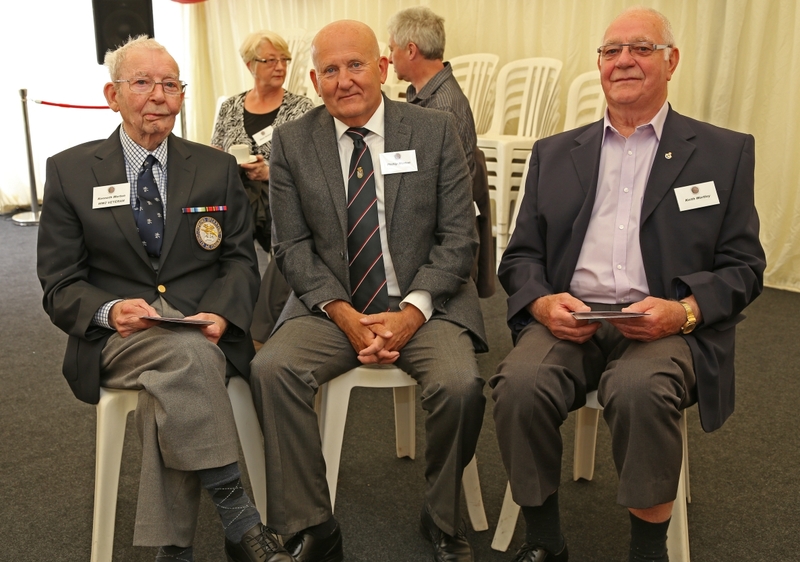 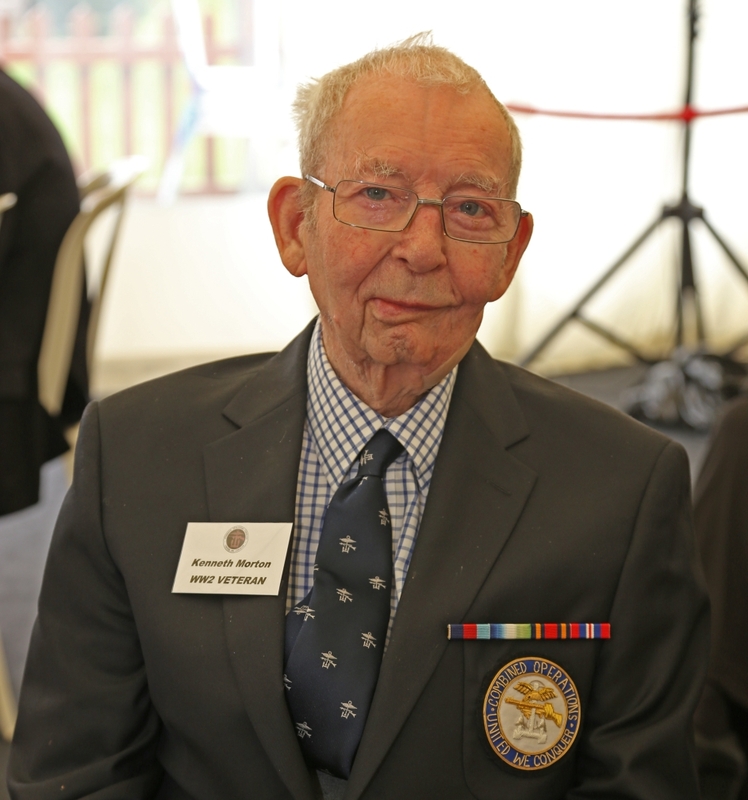 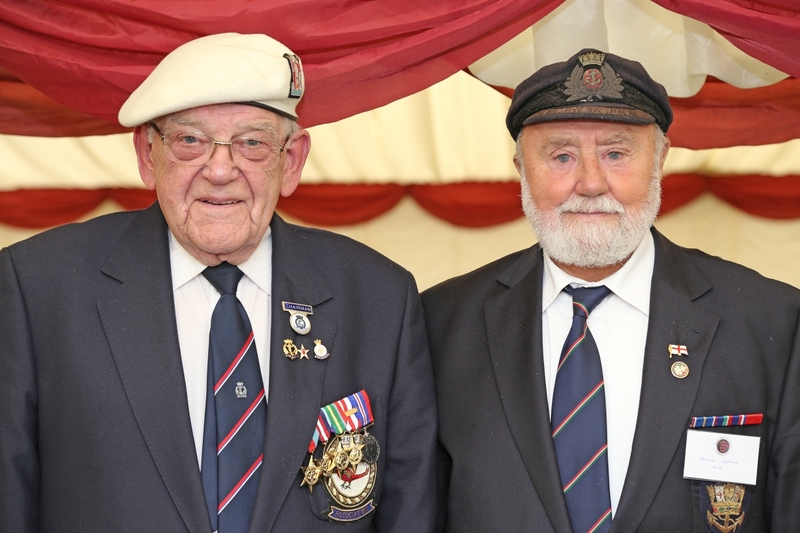 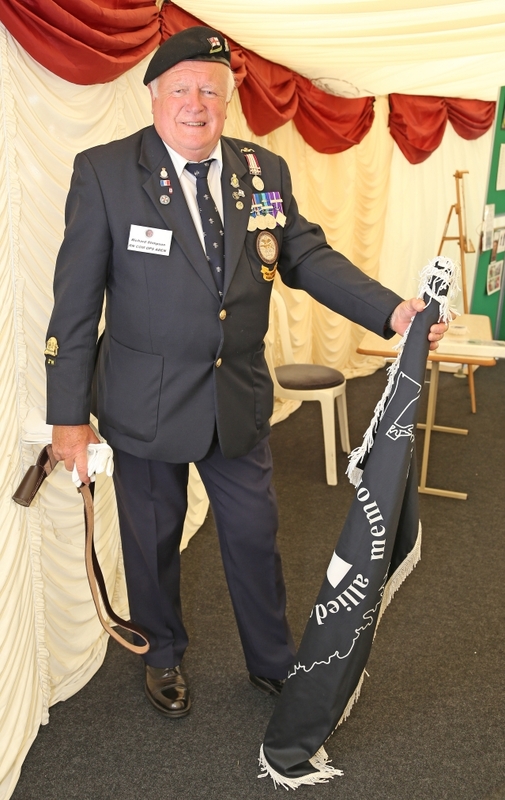 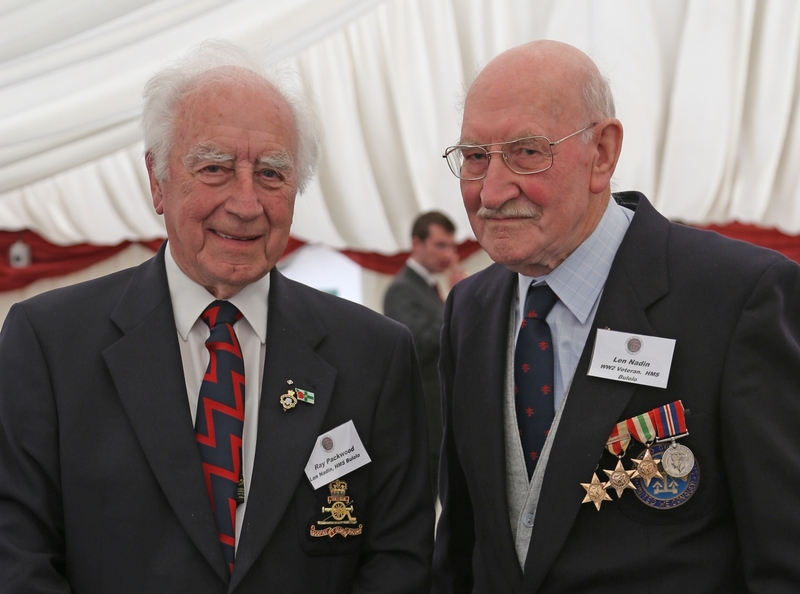 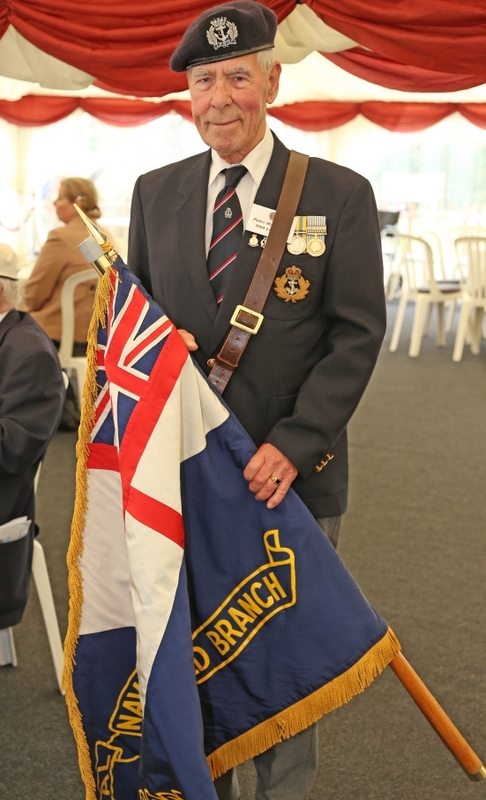 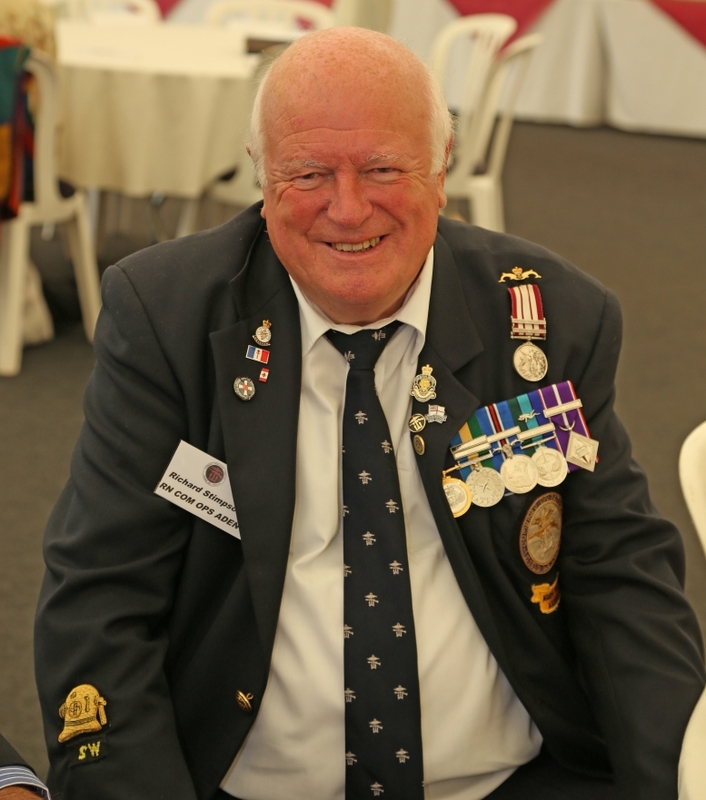 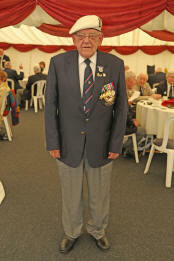 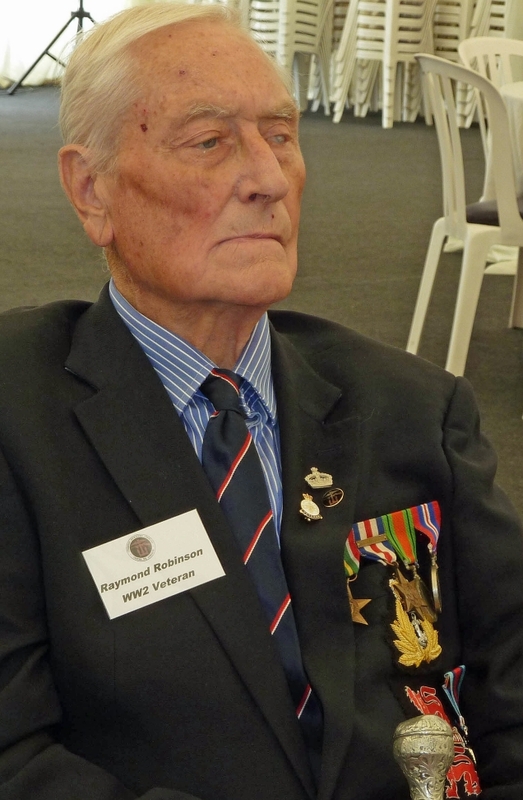 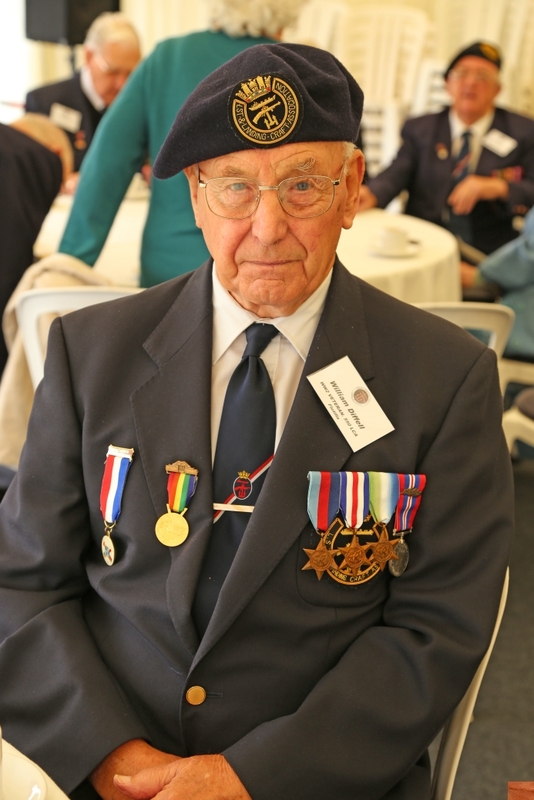 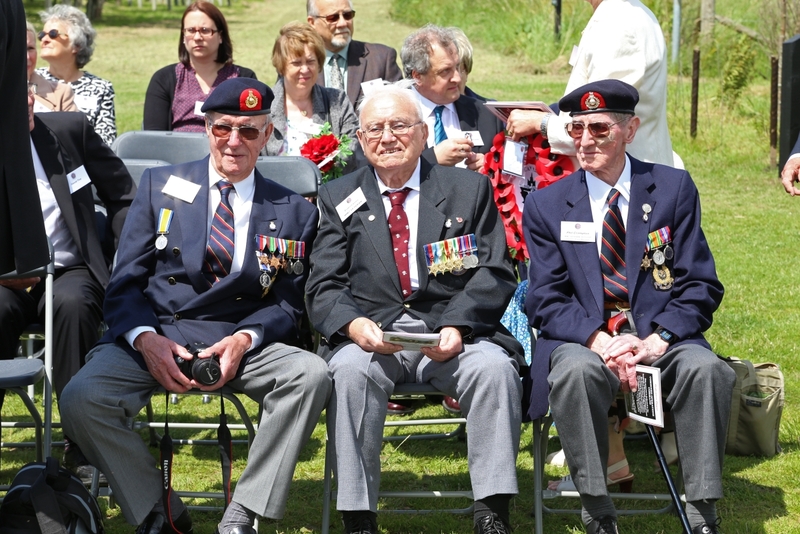 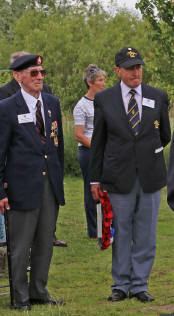 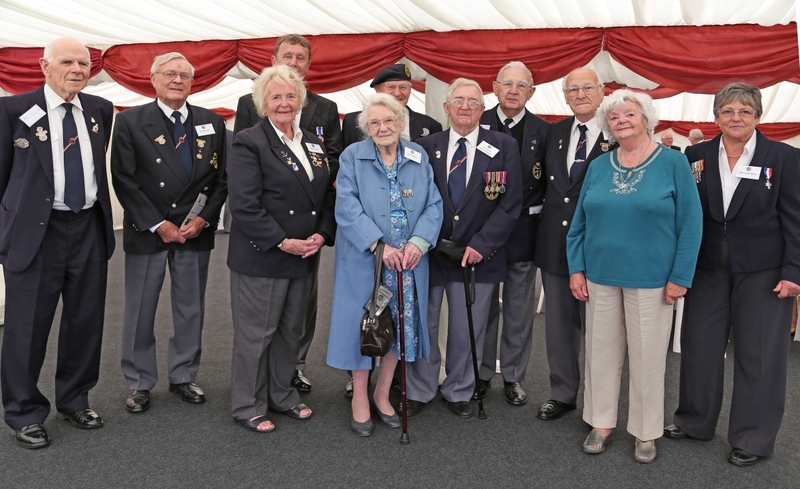 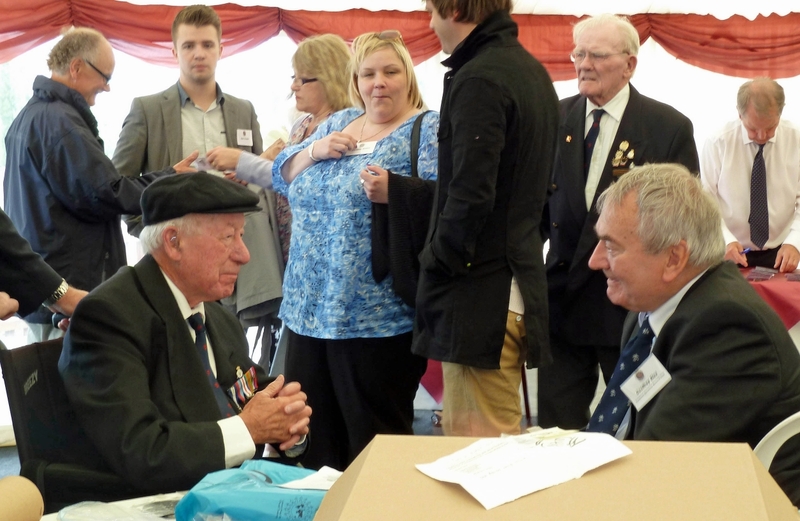 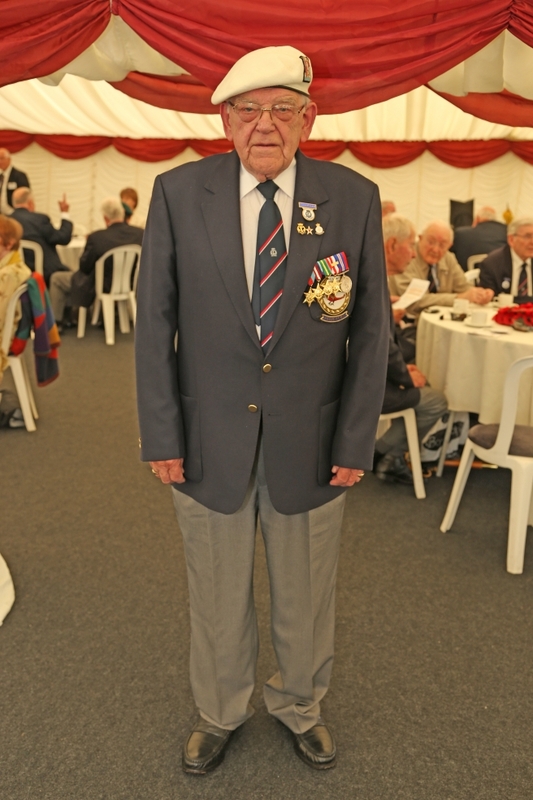 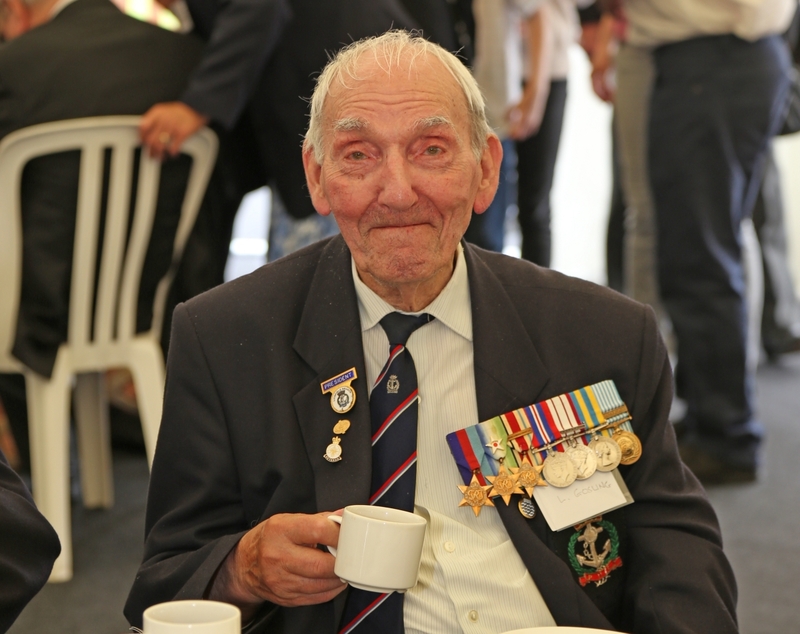 We were honoured by the presence of around 30 veterans, most of whom crewed landing craft, which carried troops and all their equipment, transport and supplies to the landing beaches most notably on D-Day. 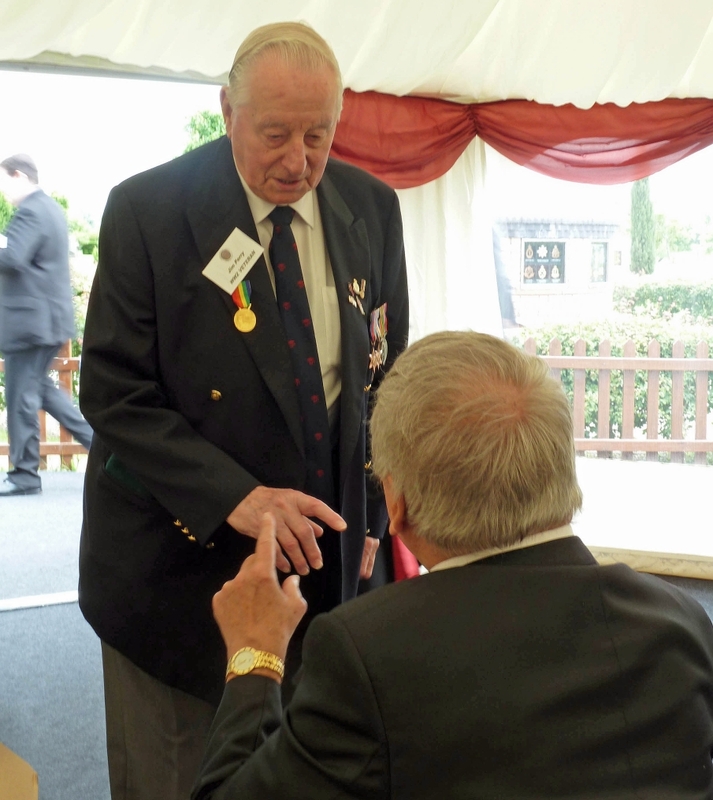 On June 4, 1940, as the last of the 333,000 soldiers evacuated from Dunkirk arrived safely back in the UK, Churchill sent an urgent message to his Chief's of staff. 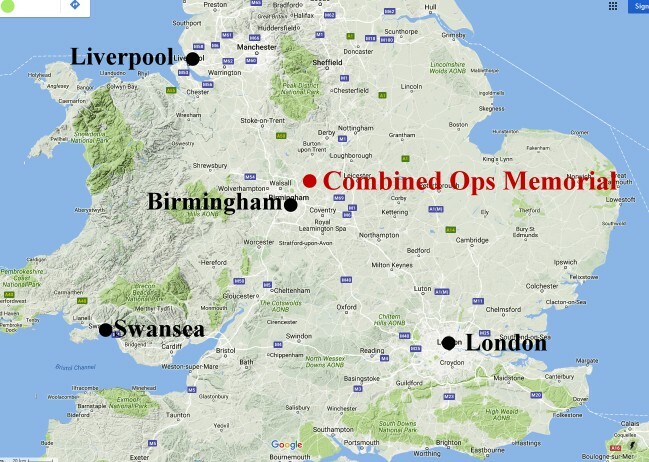 It would create an organisation that would think, plan, train and equip for offensive amphibious operations against the enemy, which would lead directly to the creation of the Combined Operations Command. 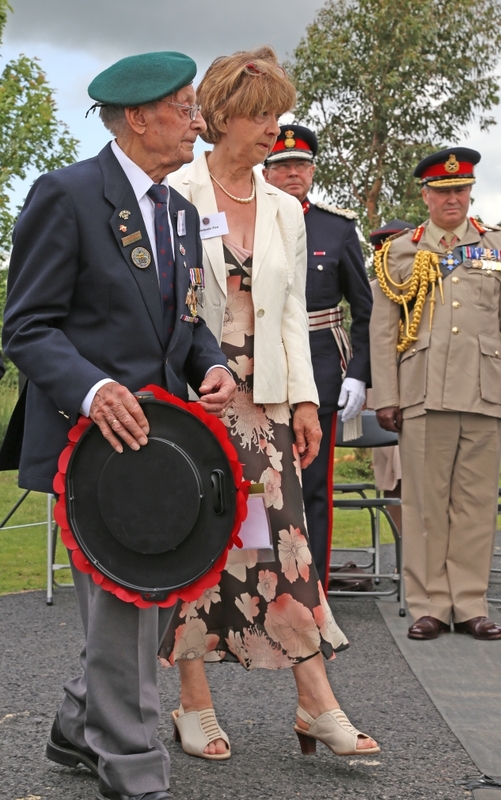 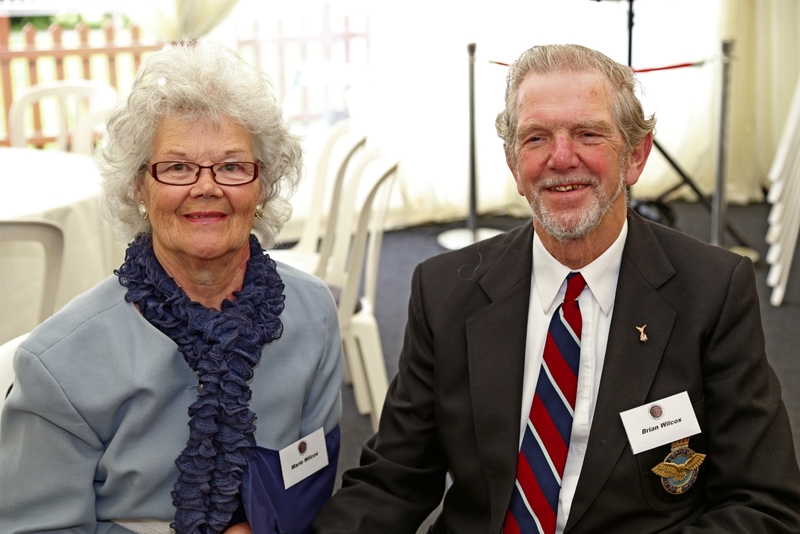 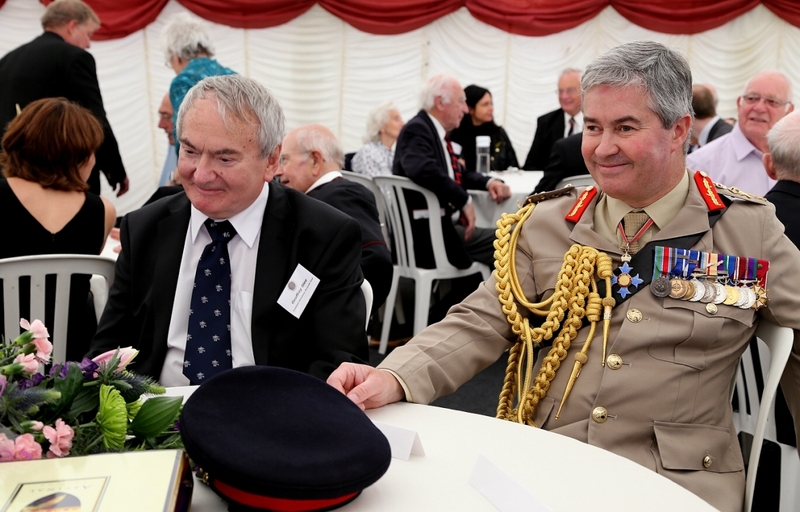 73 years on, the great achievements and sacrifices of all who served in the Command, or alongside it on amphibious operations, were publicly recognised for the first time as a unified force drawn from the Army, Navy and Air Force. 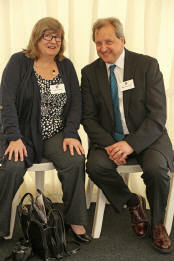 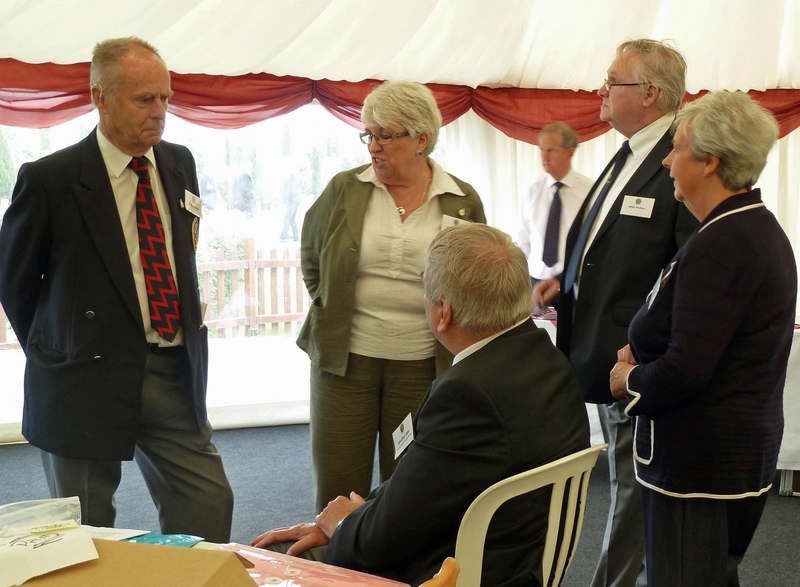 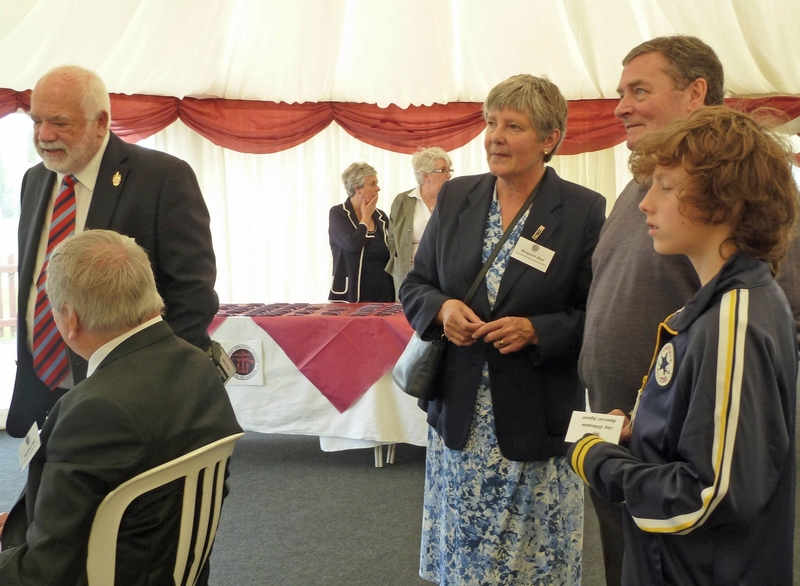 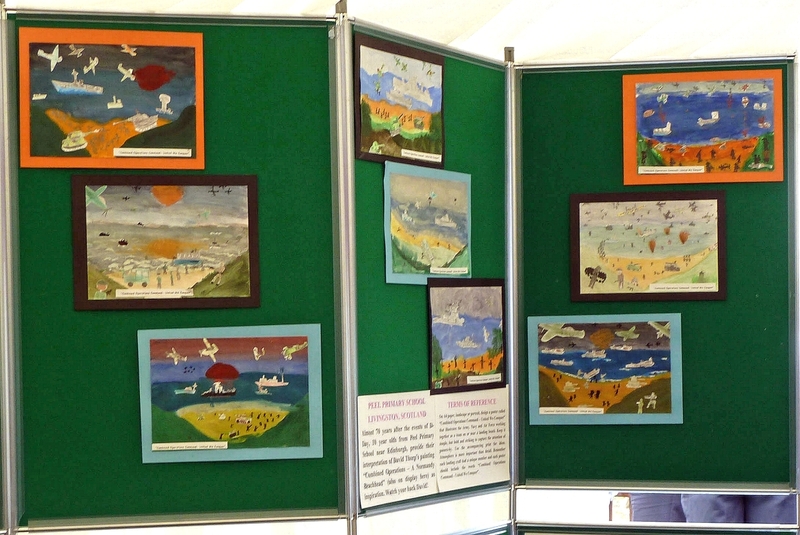 Coffee, tea and biscuits were provided from 12 noon in the Arboretum's marquee, adjacent to the visitor centre. 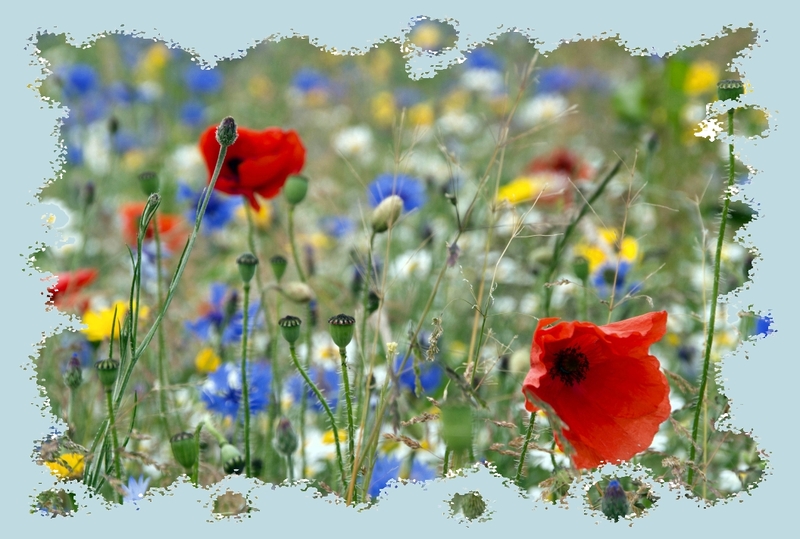 It was a welcome opportunity to recover from the journey, to exchange news and information with other guests and to meet e-mail friends for the first time. 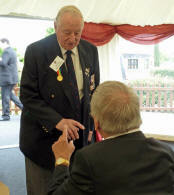 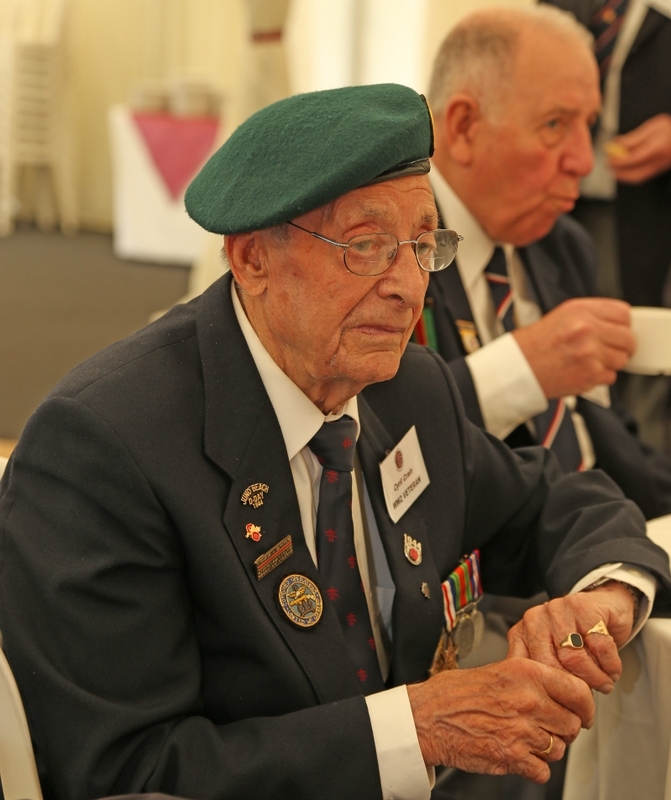 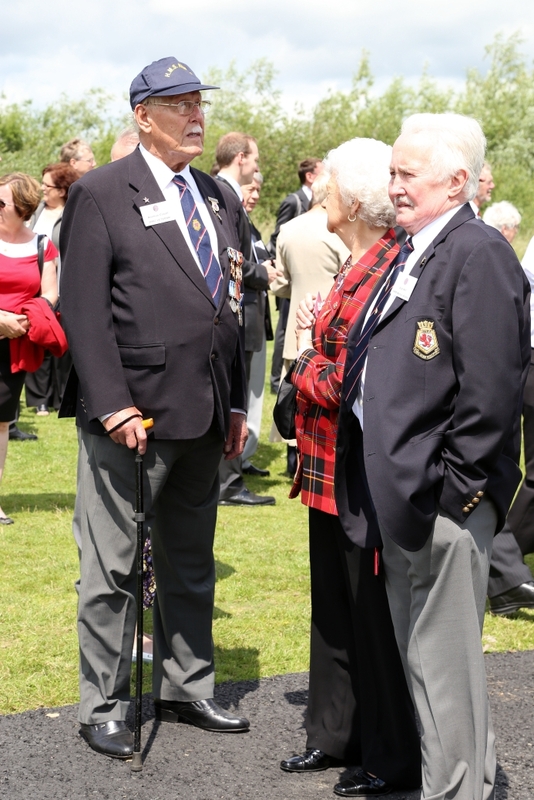 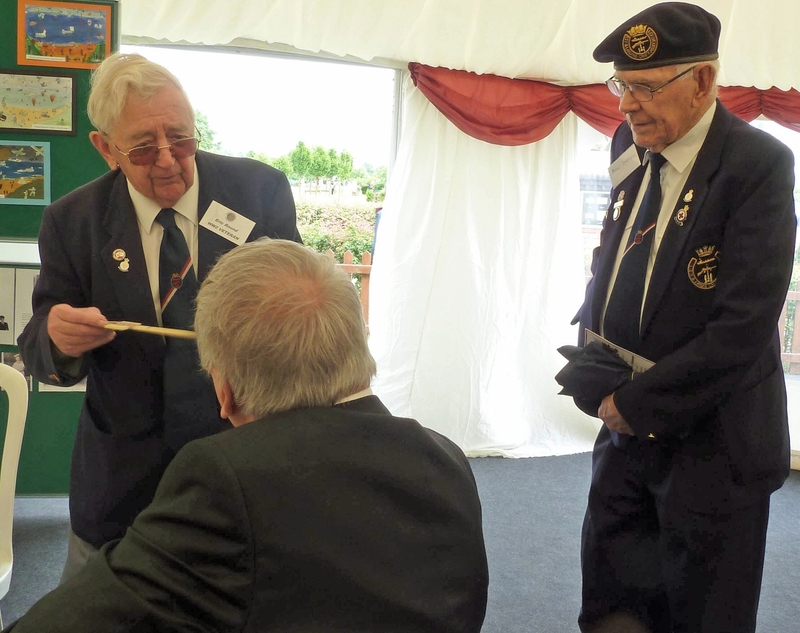 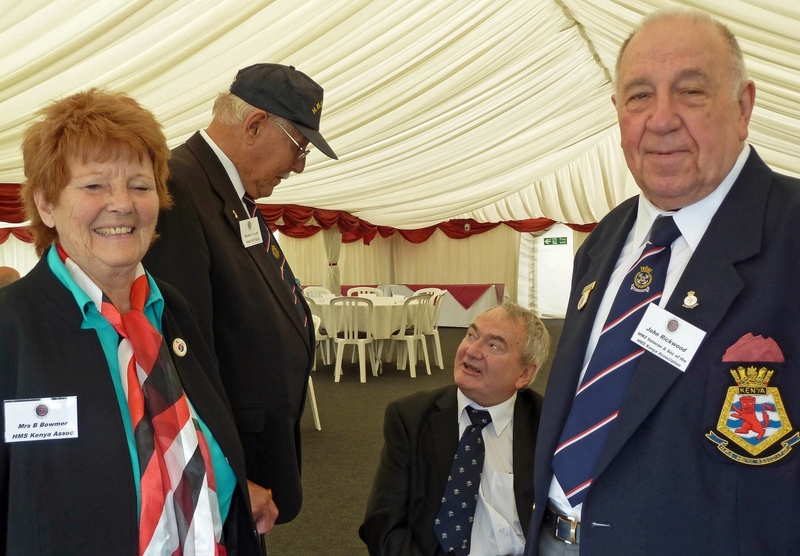 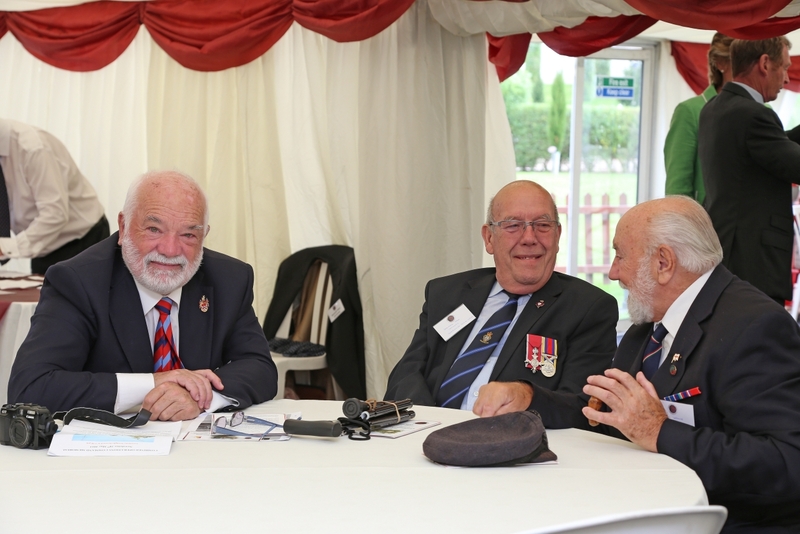 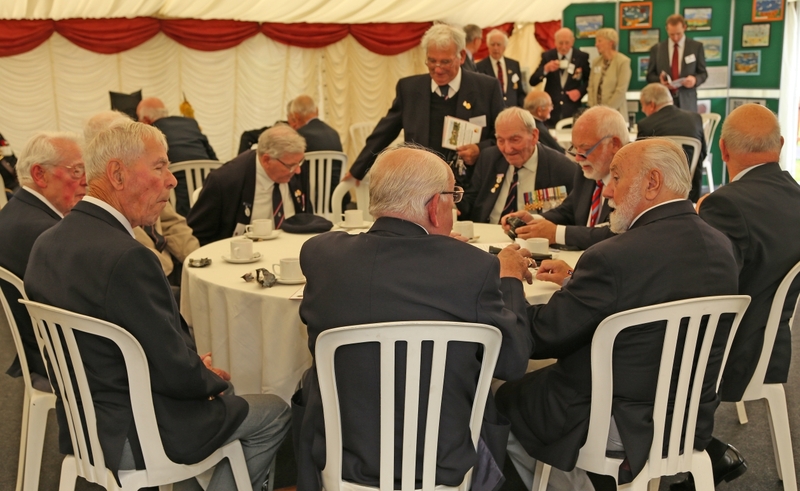 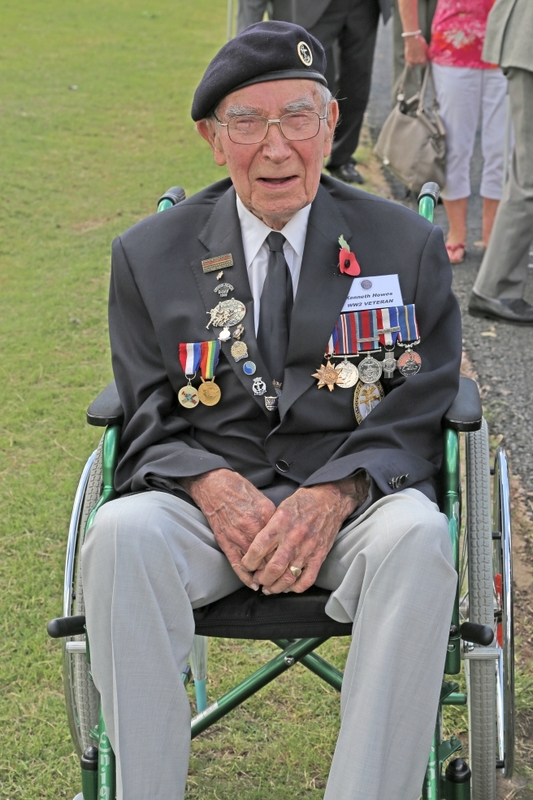 Veterans were soon engaged in animated chat, as they recalled events of 70 years earlier. 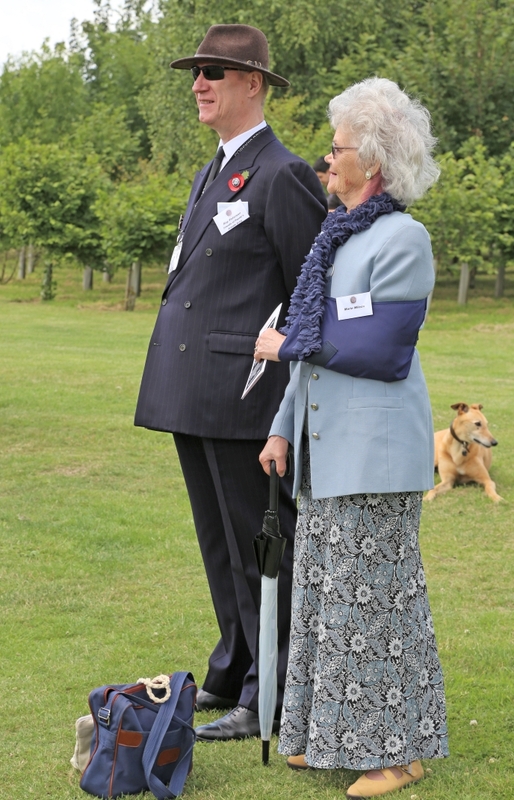 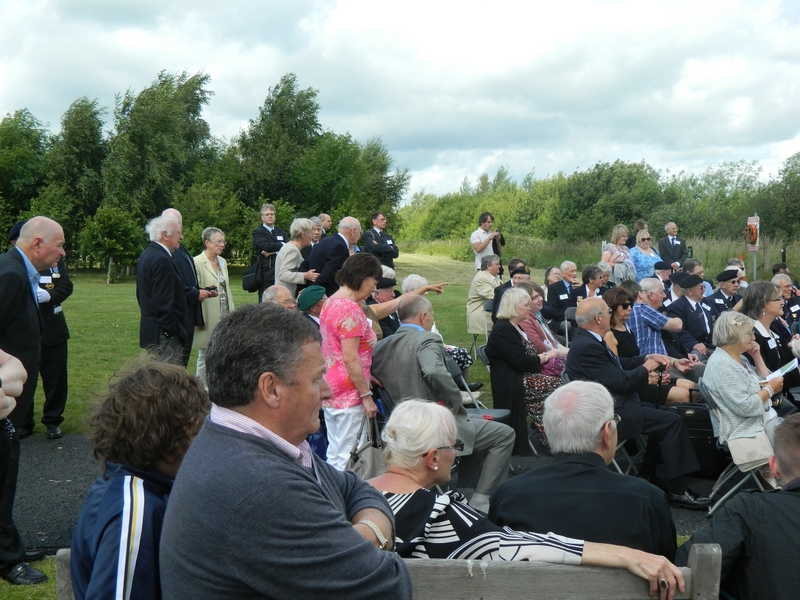 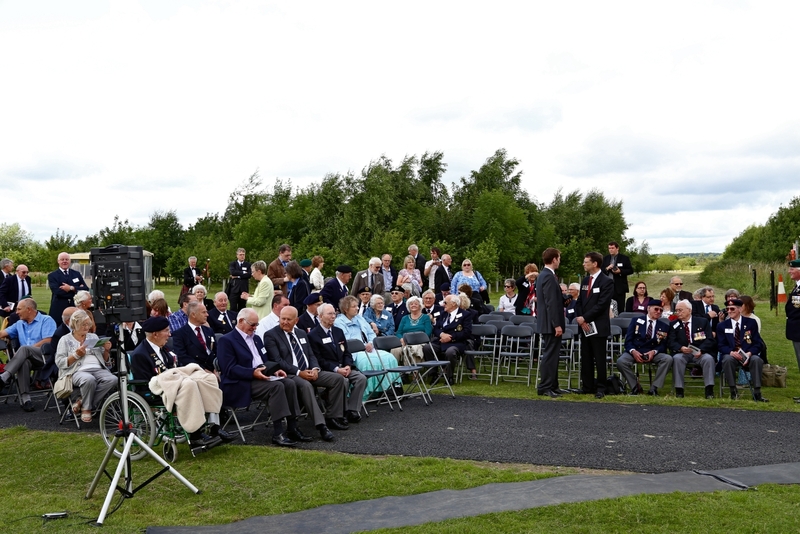 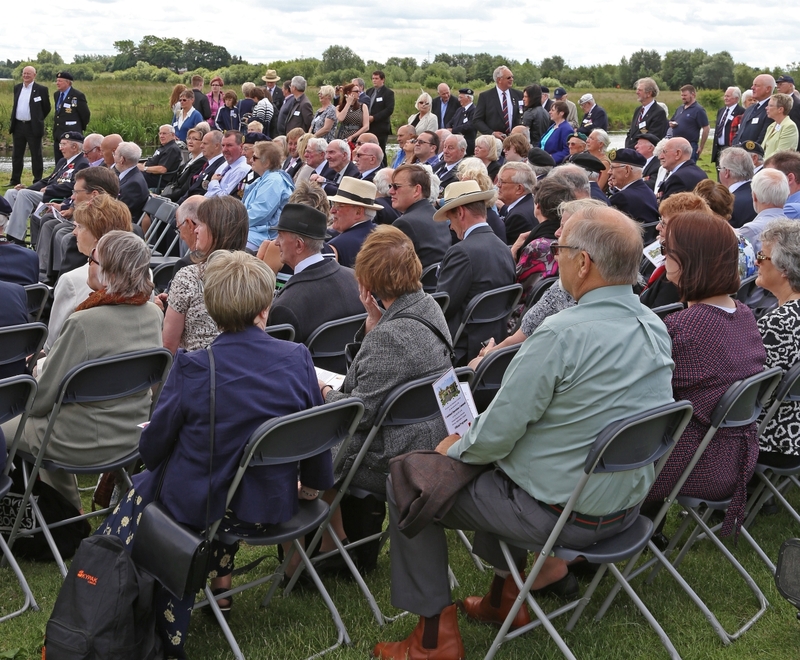 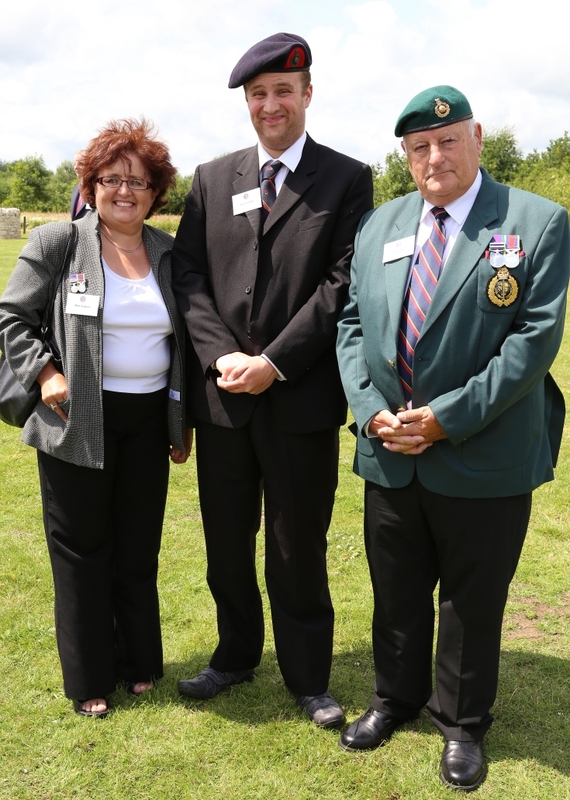 All guests received a detailed programme of the day's events and on cue, at 1 o'clock, they made their way down to the memorial site. 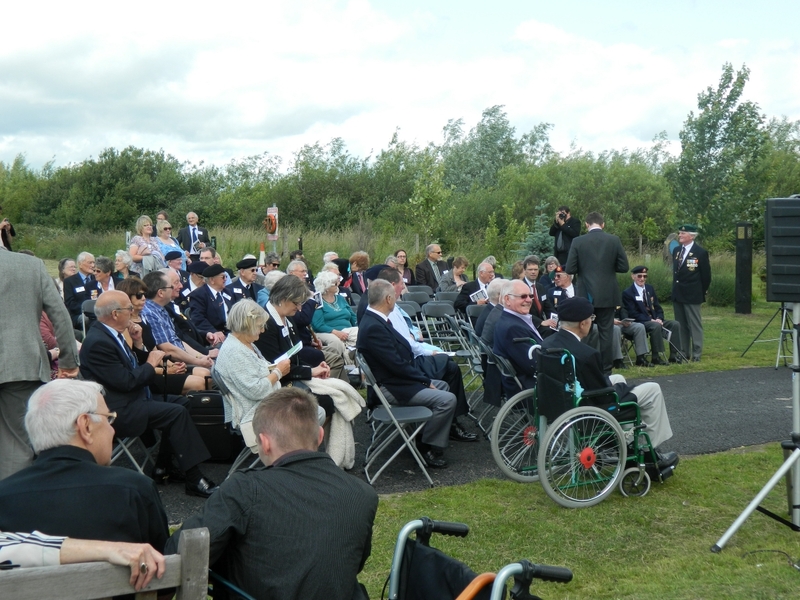 Scooters and golf style buggies transported the less ambulant. 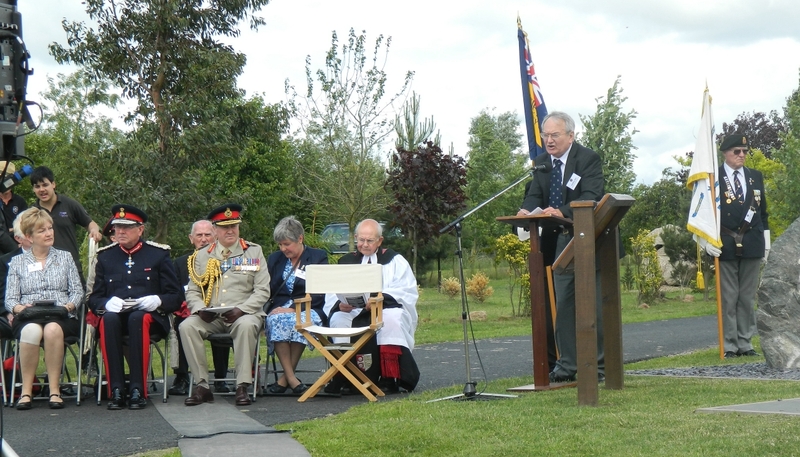 The Official Party comprised Her Majesty's Lord Lieutenant of Staffordshire, Mr Ian Dudson, CBE and his wife Jane, General Sir Richard Barrons, KCB CBE ADC, Gen, Commander of the Joint Forces Command, Military Artist, David Thorp and his wife, Olwen, the Reverend Prebendary Tony Wood and Geoffrey Slee, organiser of the event and his wife, Margaret. 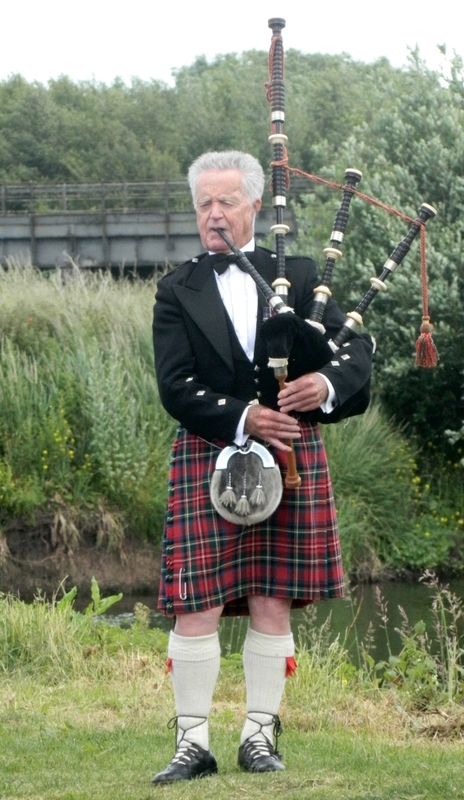 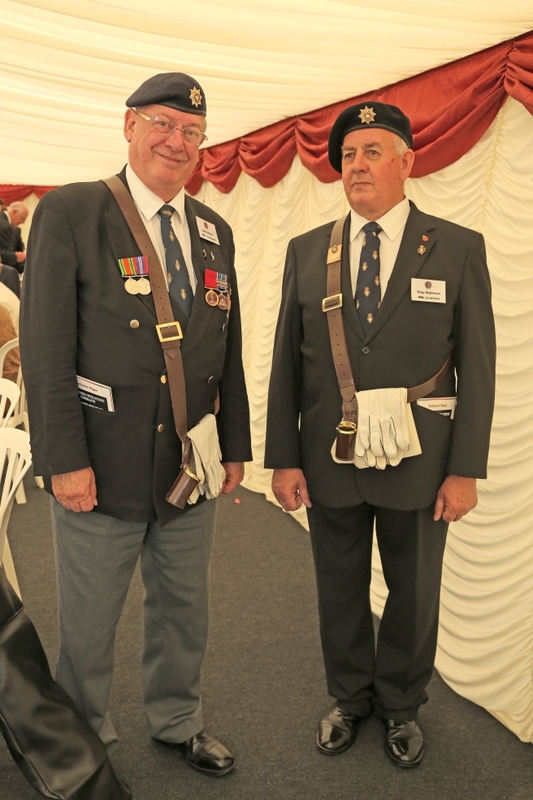 By the time the official party arrived at 1.30 pm, everyone with a job to do was in place, including 6 Standard Bearers, a piper and a bugler. 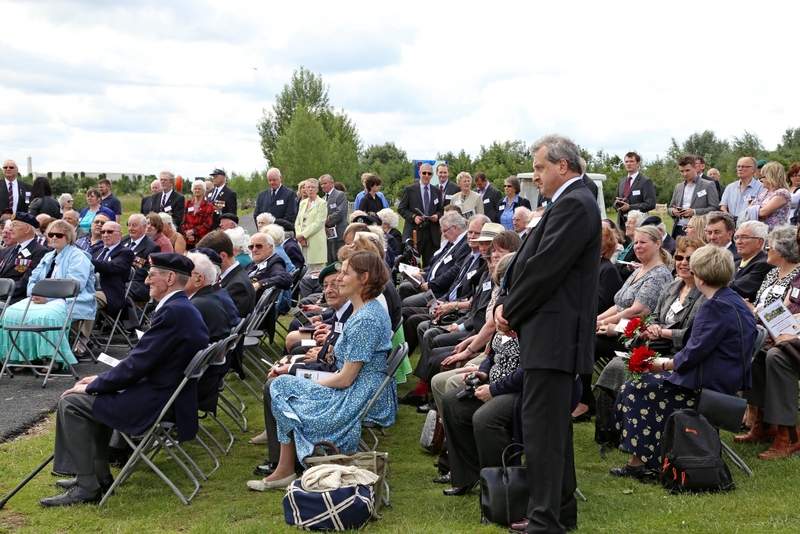 Seating was neatly arranged in a cosy L shape. 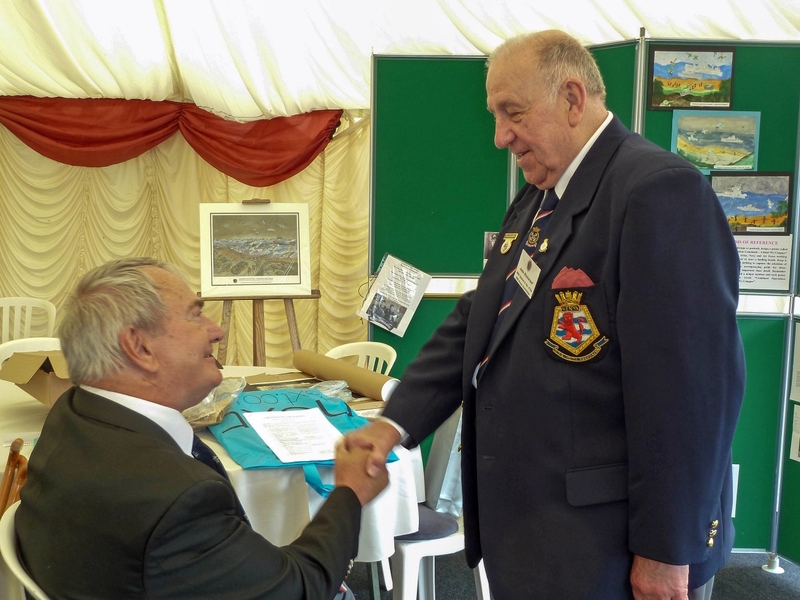 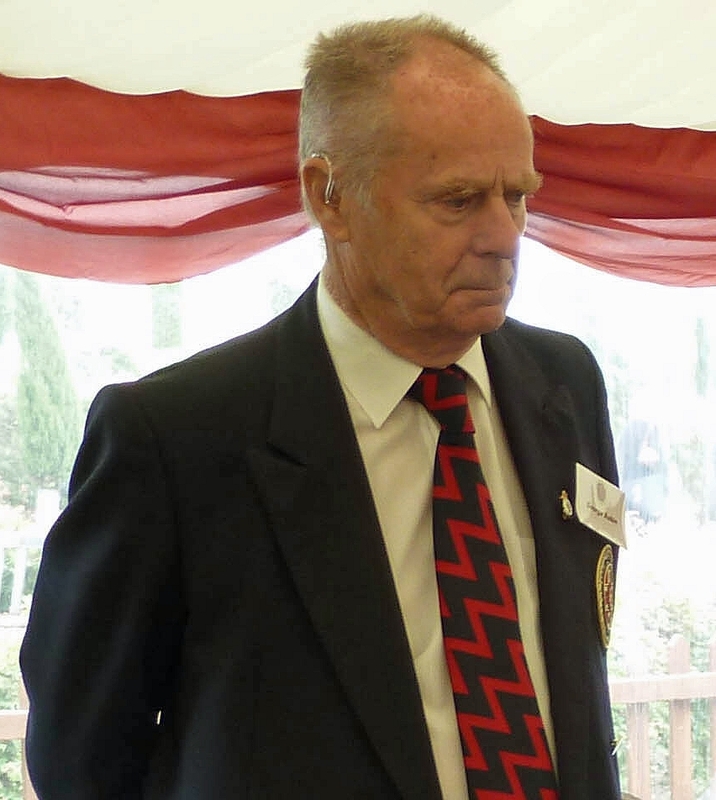 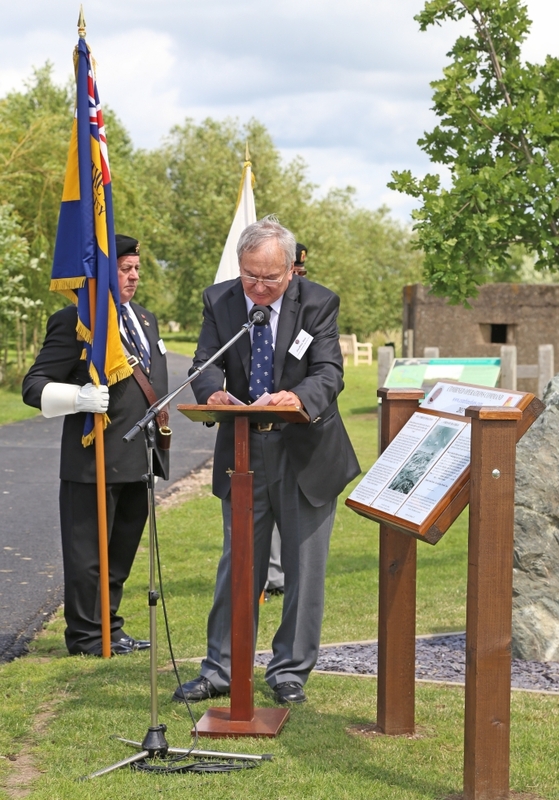 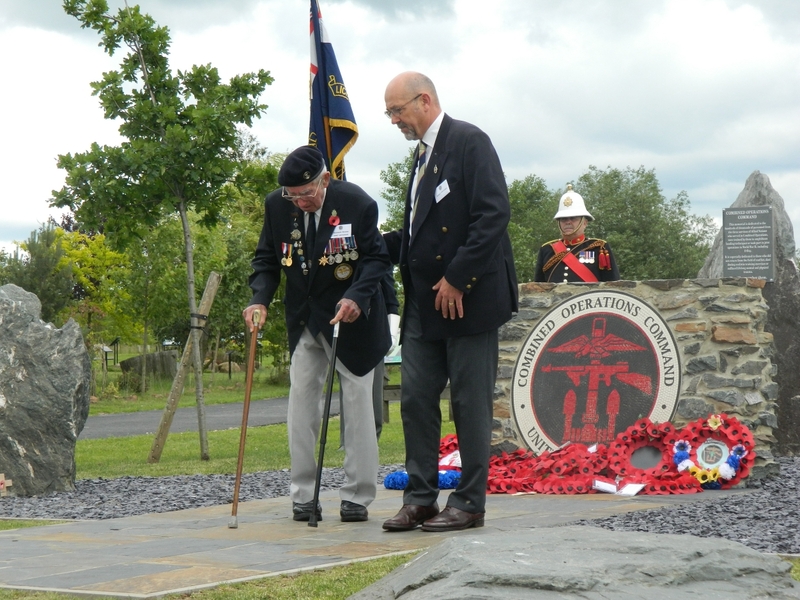 Proceedings were opened by event organiser, Geoff Slee, with a warm welcome and a brief history of the Combined Operations website and memorial projects. 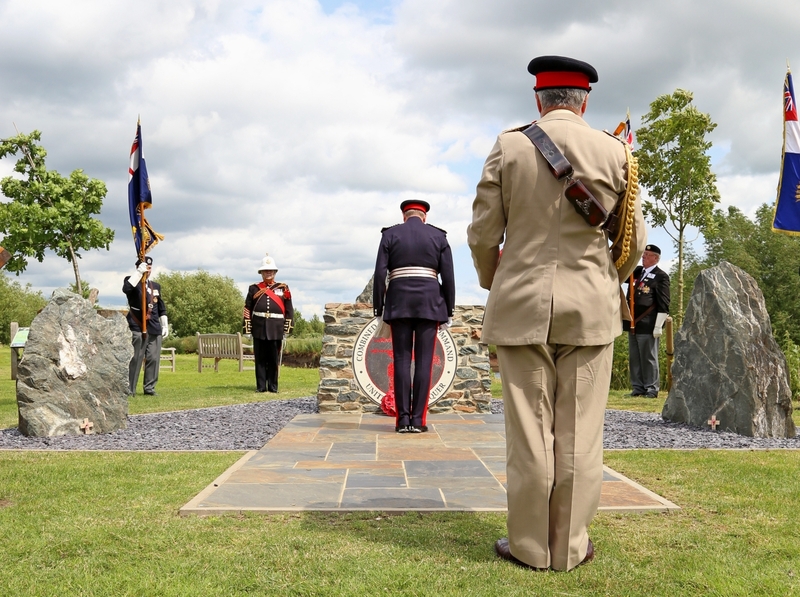 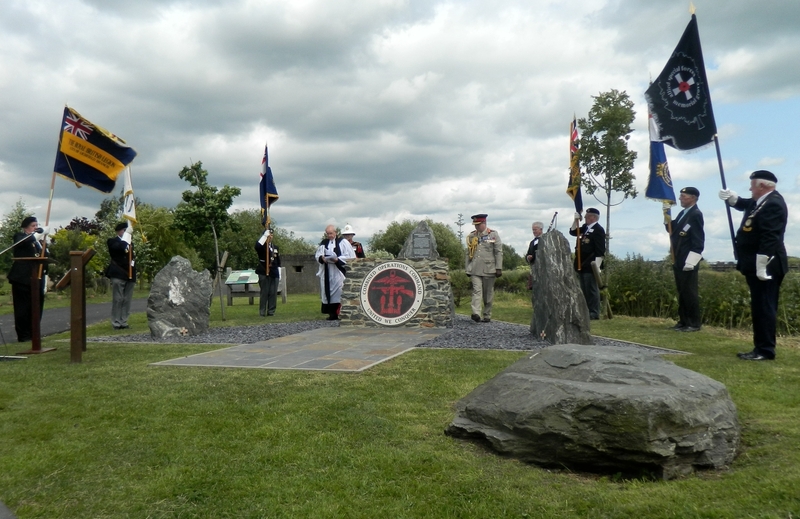 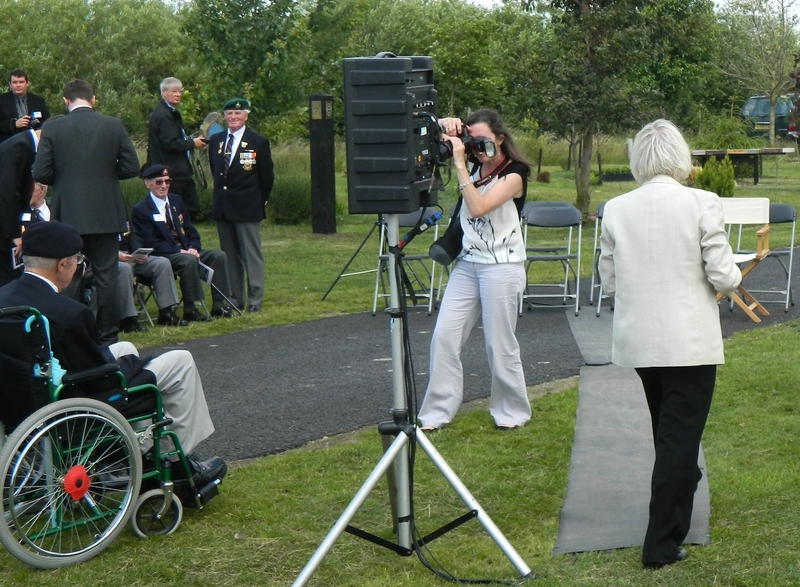 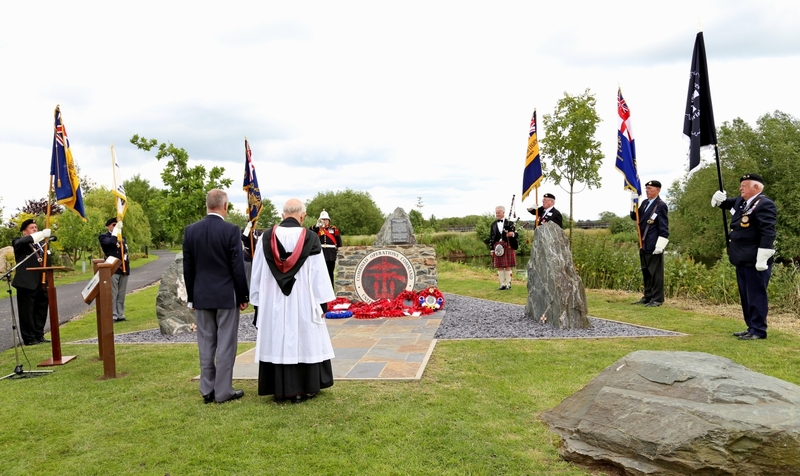 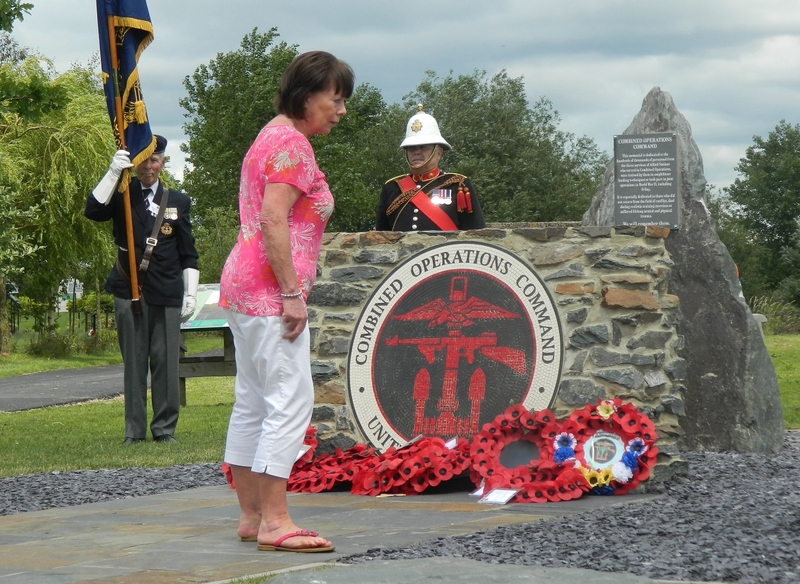 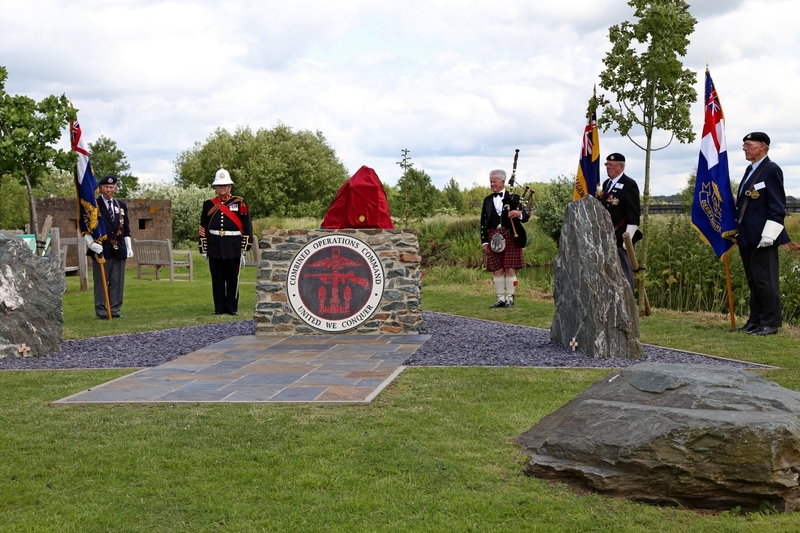 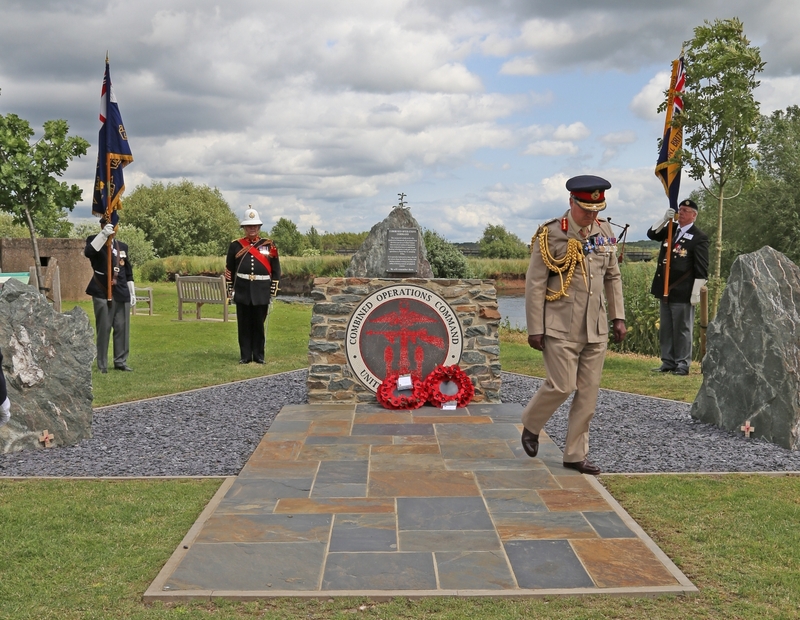 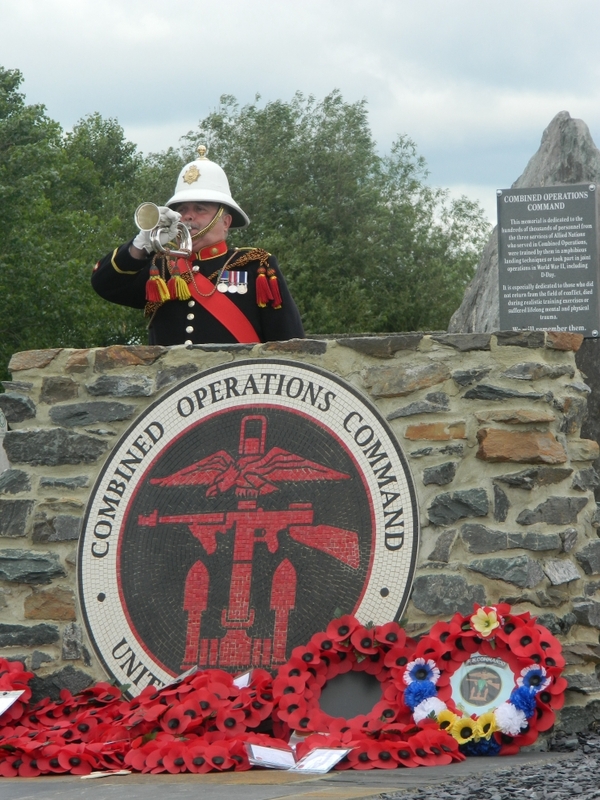 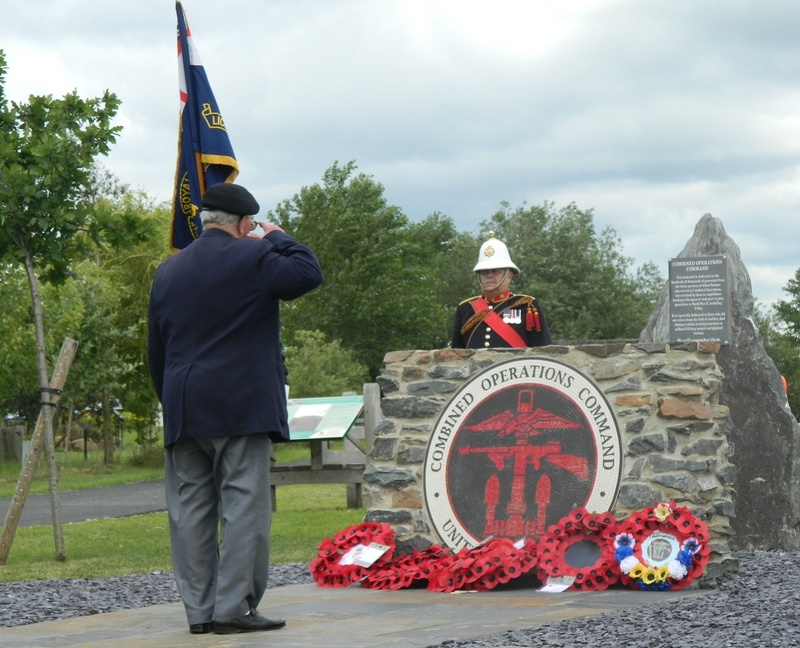 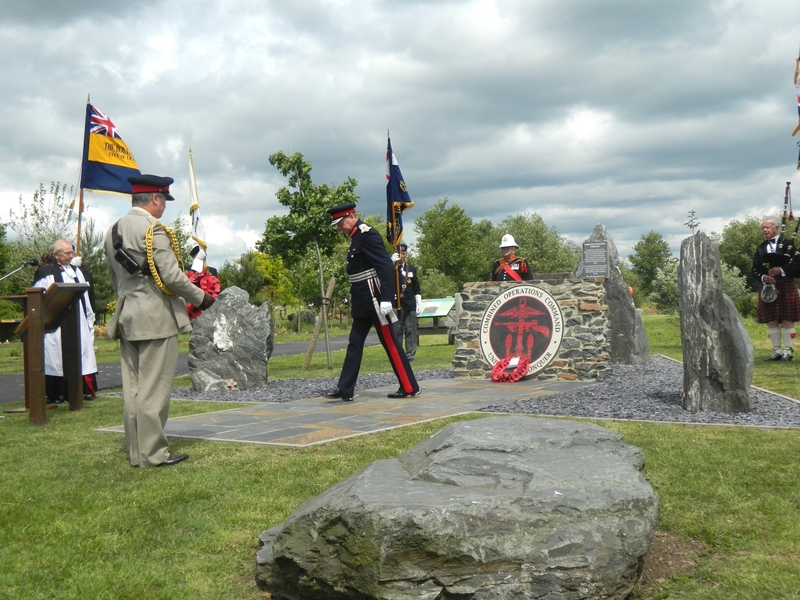 Around £15,000 had been raised through donations and fund raising initiatives, of which around £13,300 was spent on the construction of the memorial. 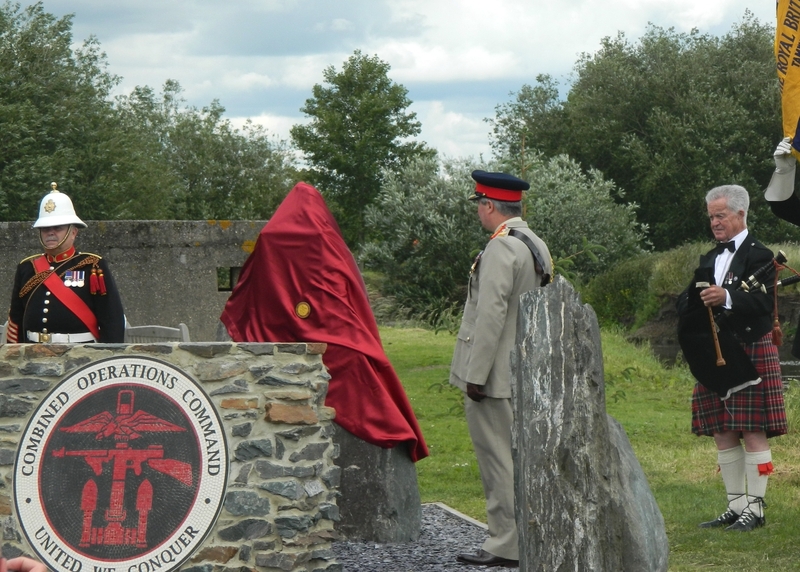 He explained that there was a high level of symbolism in the design of the memorial. 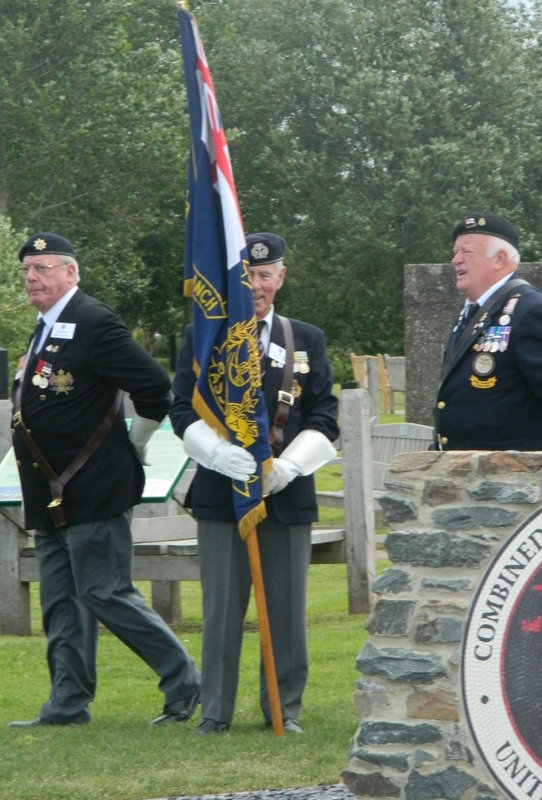 The spearhead shape reflected the attack formation adopted on Commando raids and major landings, with the apex representing the initial assault troops, who faced the brunt of the enemy’s coastal defences, the remainder of the triangle representing the follow on invading force after the beachhead had been secured, and the shaft representing the reserve forces. 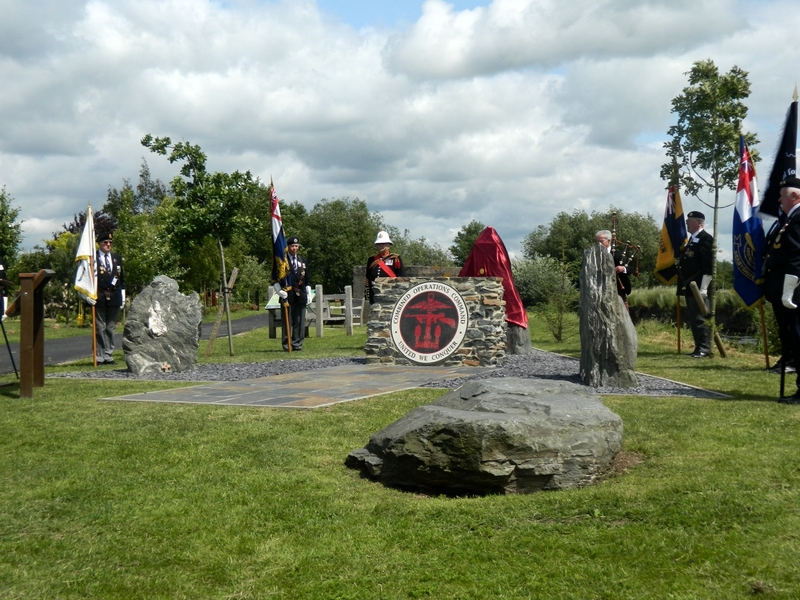 The 3 standing stones and the 3 trees represented the 3 services - oak for the Navy, ash for the Army and Sitka spruce for the RAF; timber used by each of the services in the past. 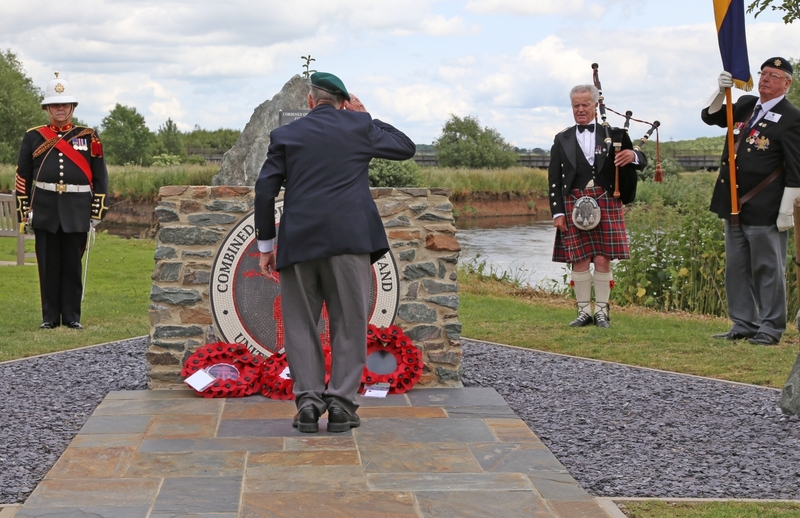 All the stones came from the shores of Loch Fyne in Scotland, where 250,000 personnel from the 3 services trained together in amphibious landings, using a variety of landing craft. 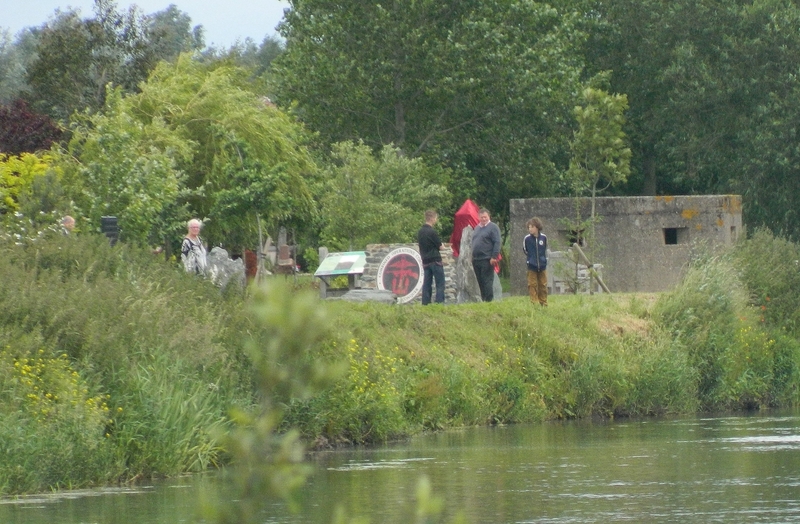 The WW2 pillbox in the background and close proximity of the River Tame provided additional ambiance to the tranquil setting - water and defensive gun positions. 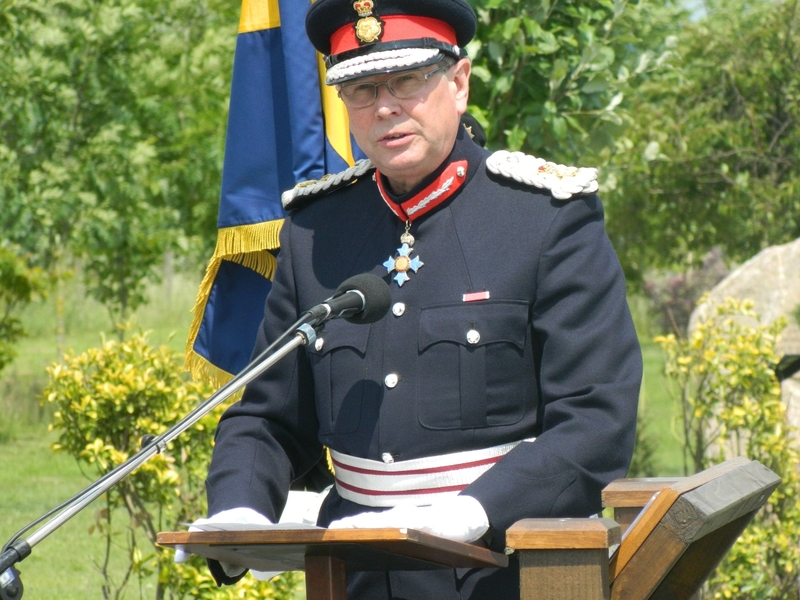 General Barrons provided a brief history of the Combined Operations Command from the prickly relationship Sir Roger Keyes, Director of Combined Operations, had with the Chiefs of Staff, through the Mountbatten years to the end of the war and beyond, under the stewardship of General Laycock. 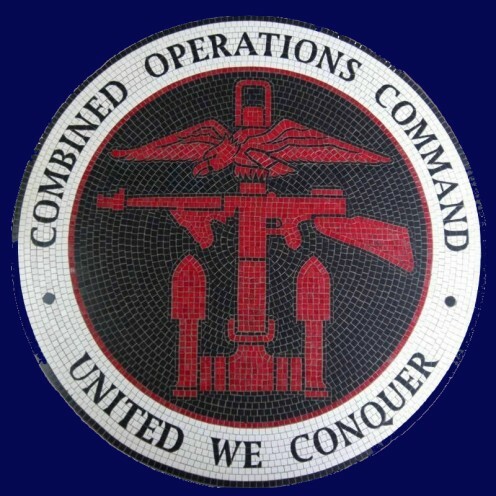 The role of the present day Joint Forces Command was, of course, very different but there was much affinity between the two commands as the wearing of the Combined Operations badge by some units of the Joint Forces Command, testified. 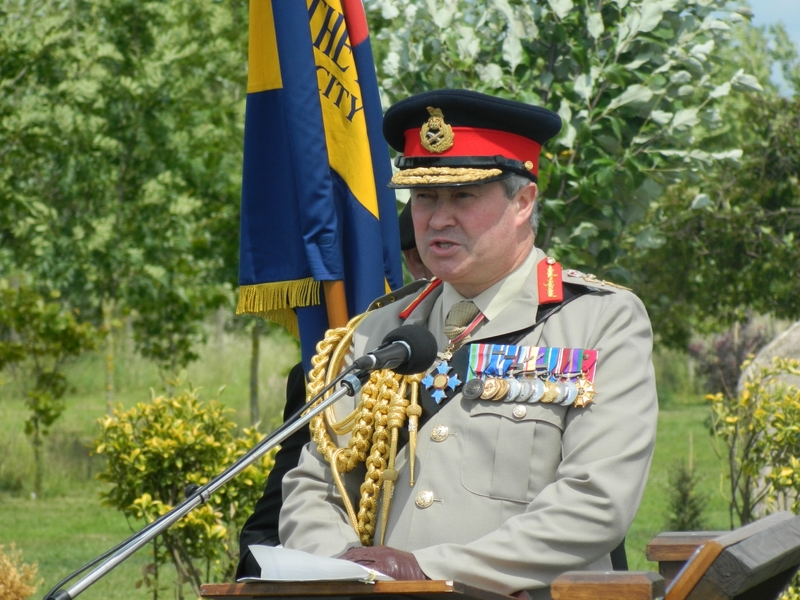 Click here to read General Barrons' speech. 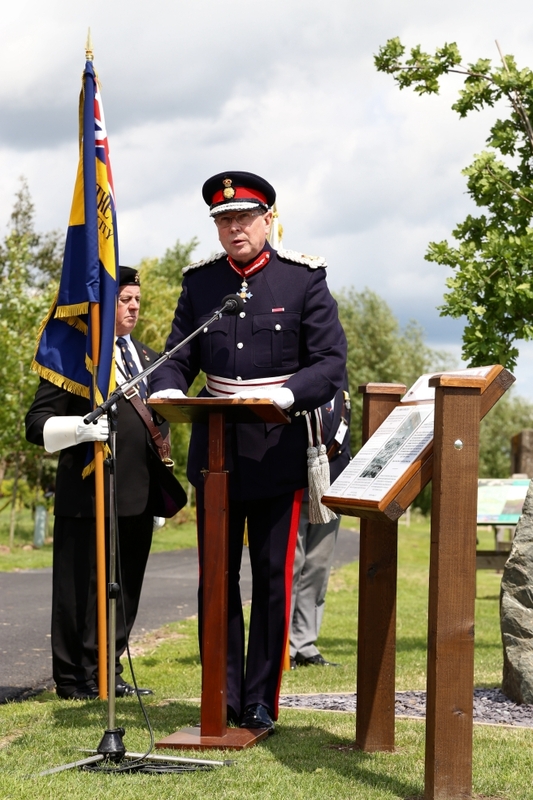 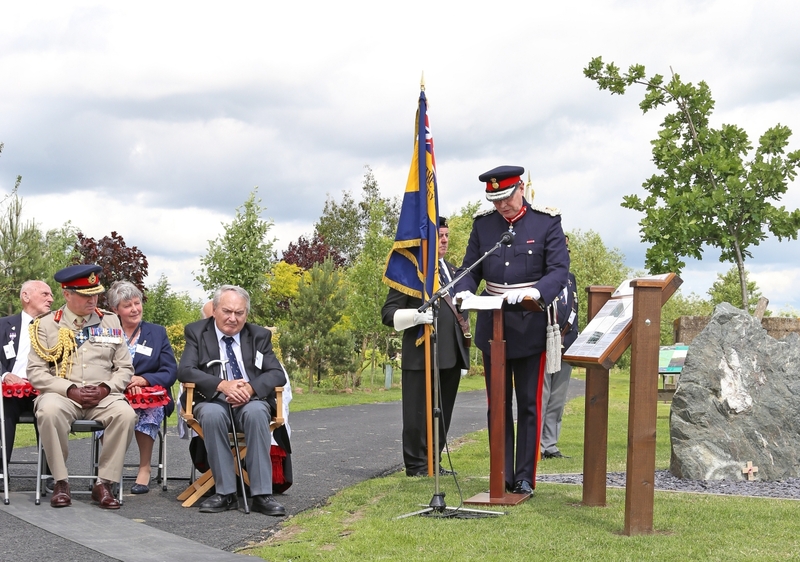 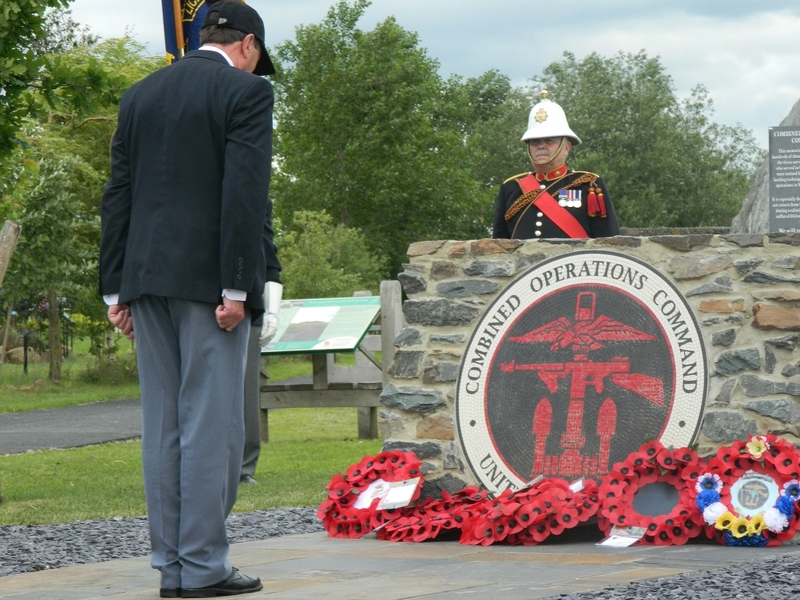 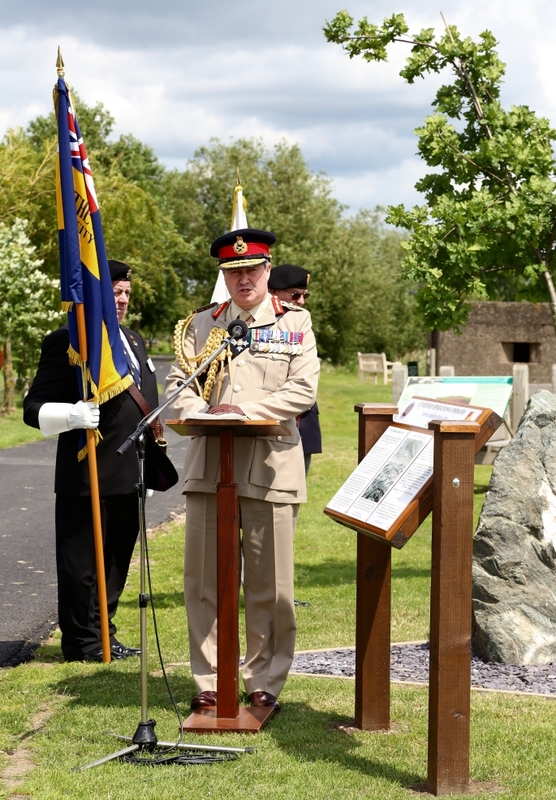 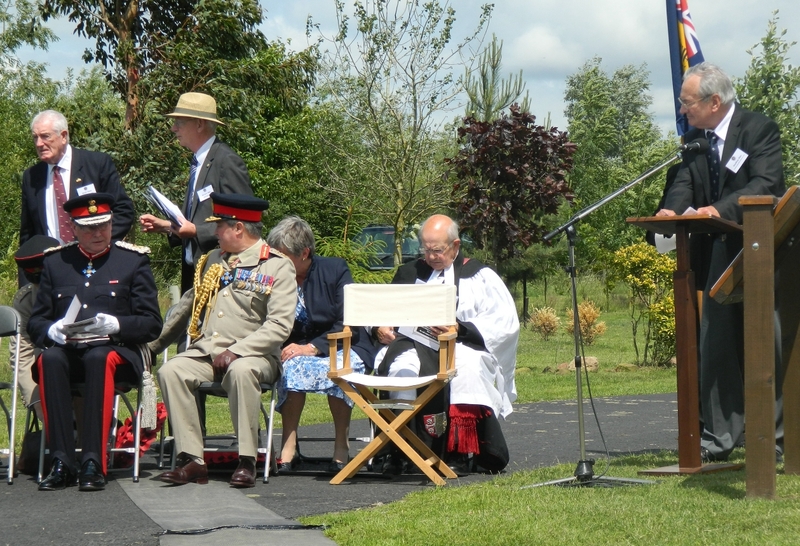 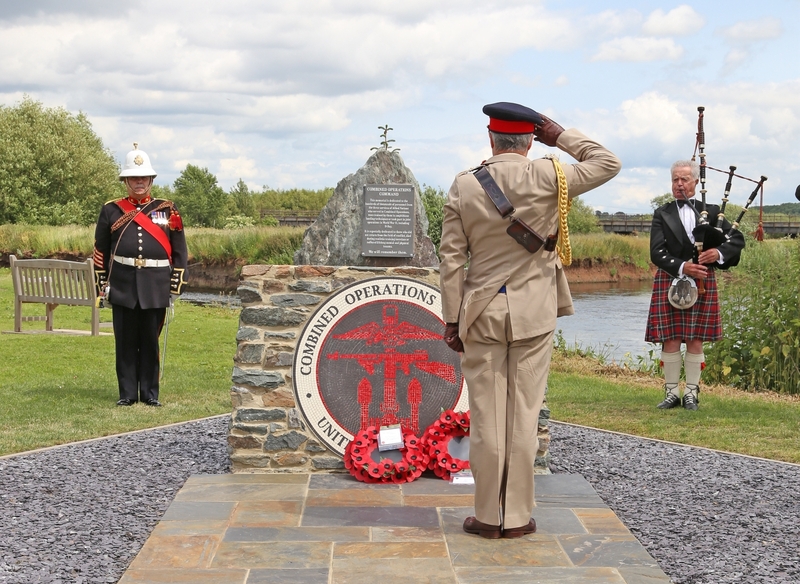 Lord Lieutenant Dudson reminded everyone that the Combined Operations Command website would remain the educational component of the memorial, while a demand existed for the information it contained. 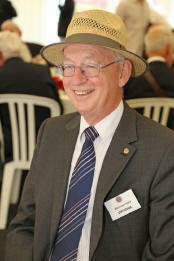 The website was visited by 250,000 people each year, recording millions of hits. 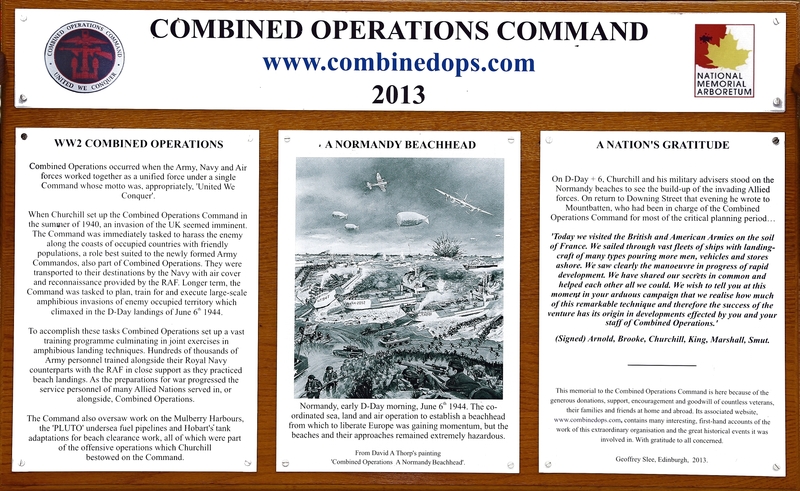 With the advent of mobile phones and computer tablets, it would soon be possible to see what the memorial represents from the Combined Operations website, while visiting the memorial. 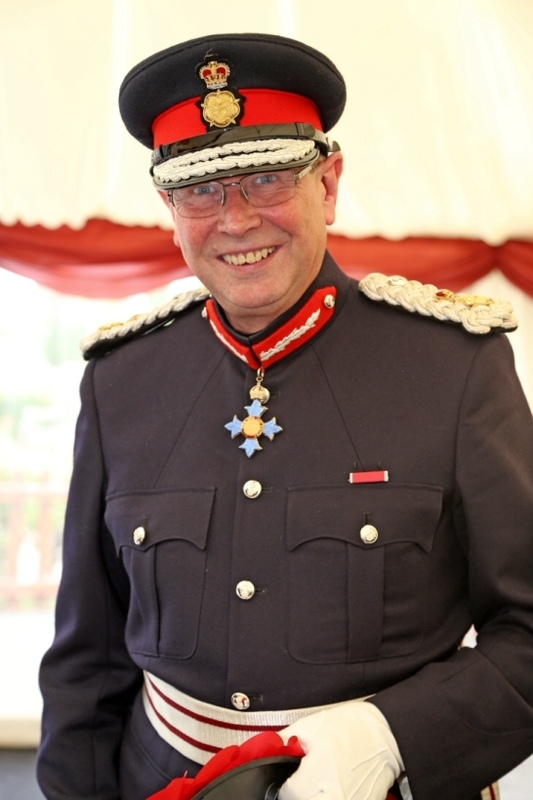 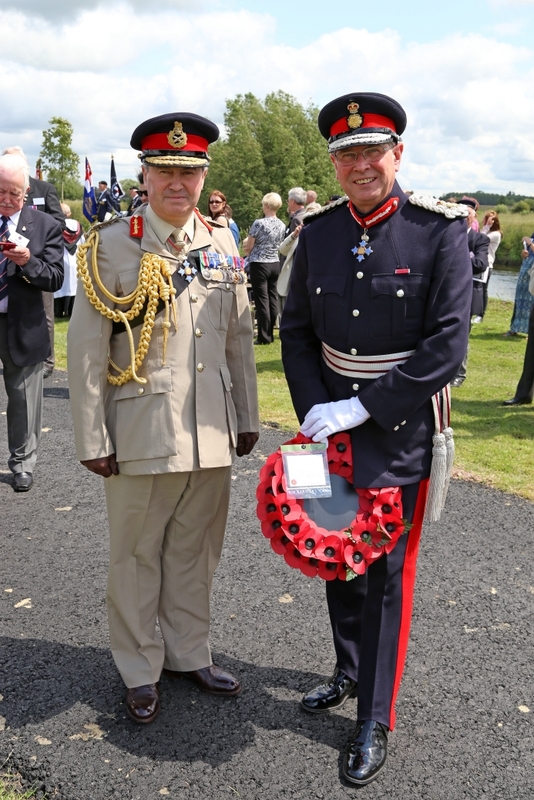 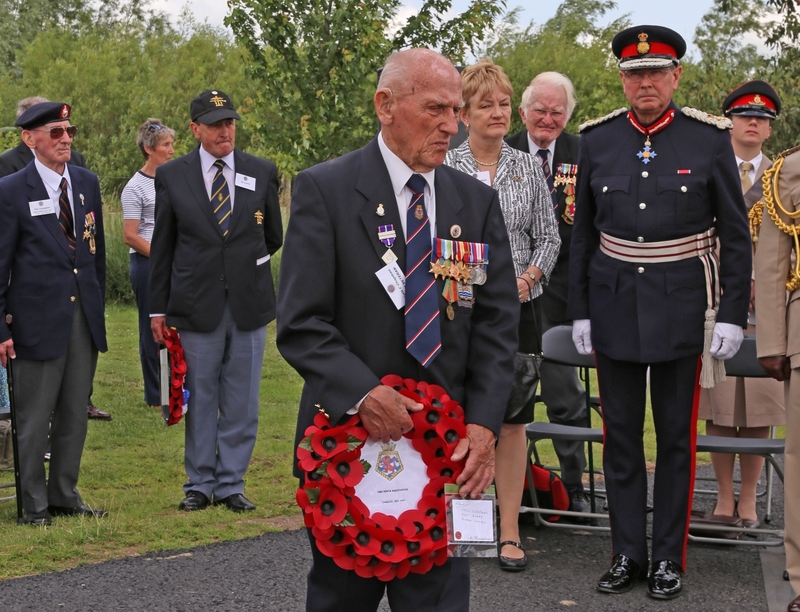 HM Lord Lieutenant for Staffordshire laid the first wreath, followed by General Barrons. 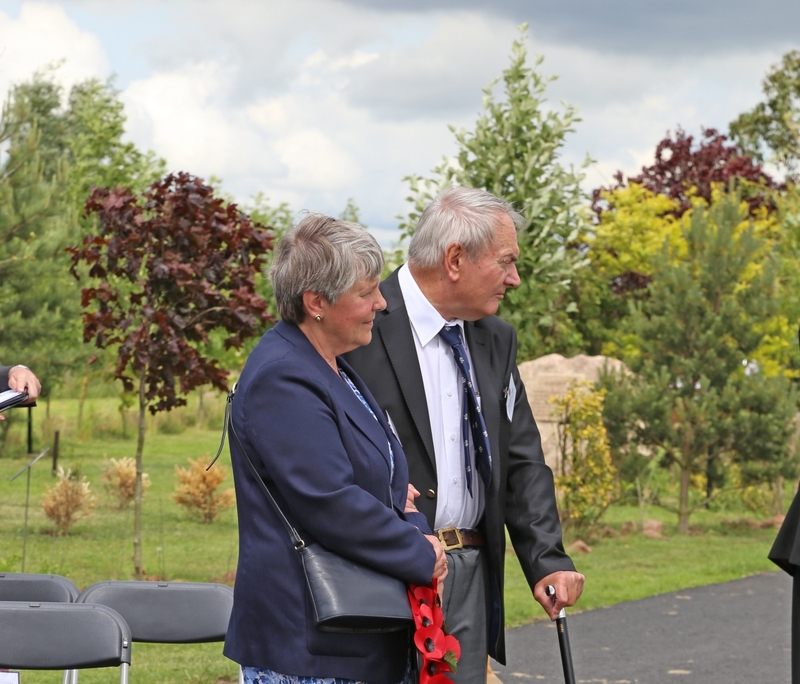 Two great grandchildren of RAF Combined Ops veteran, John Glen, laid the next wreath on behalf of all who supported the memorial fund. 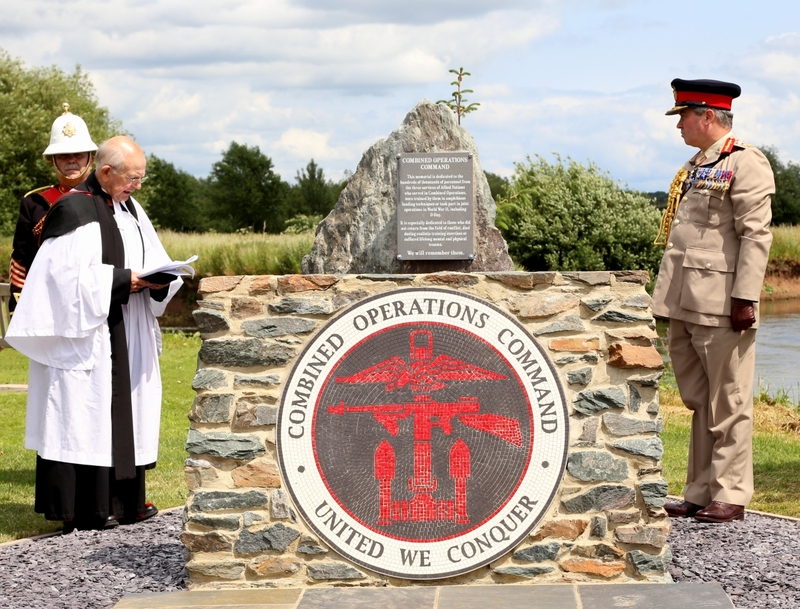 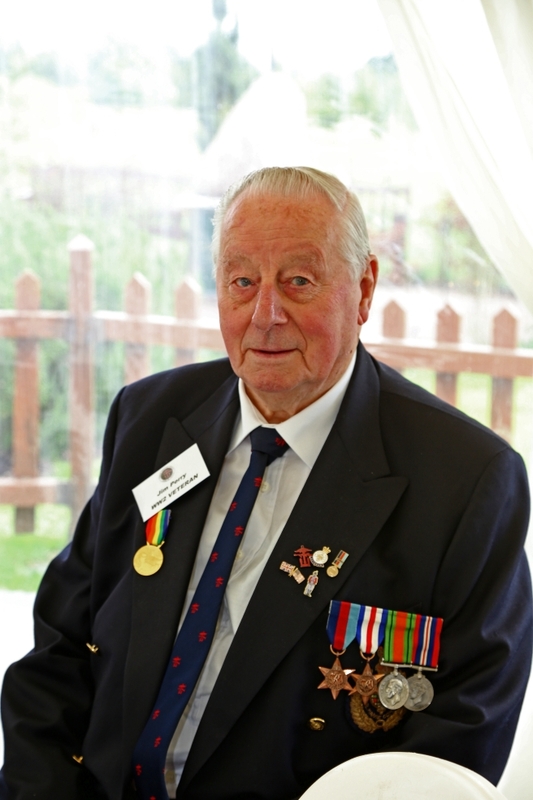 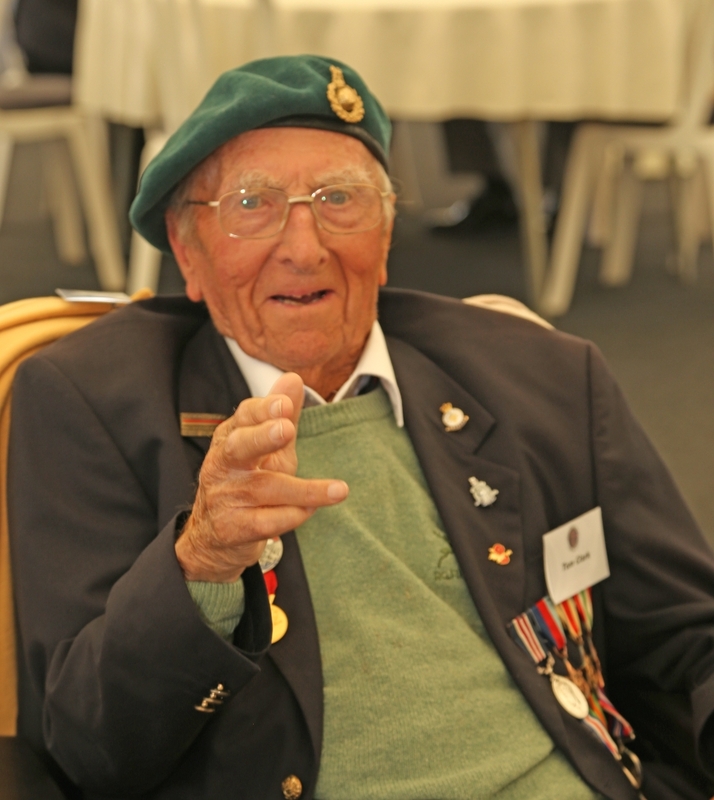 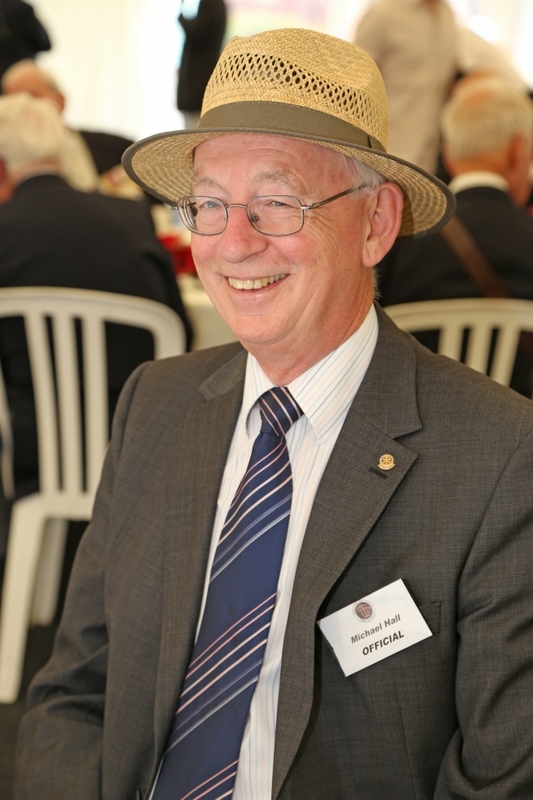 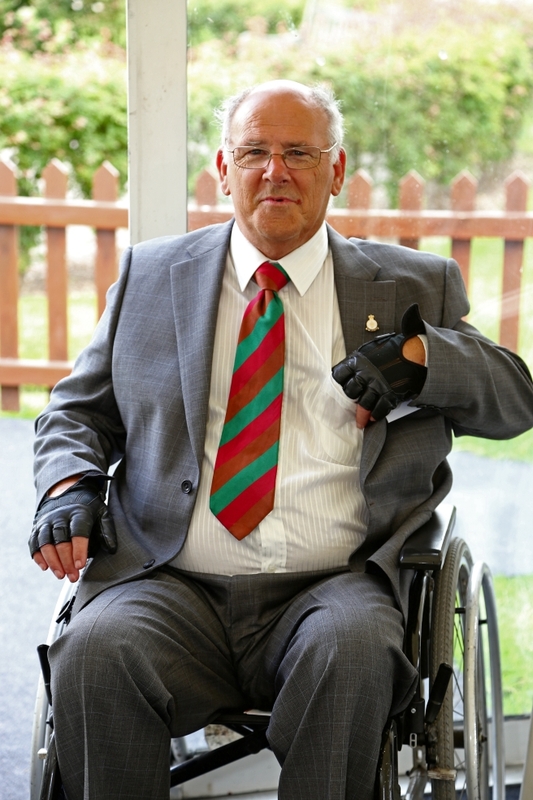 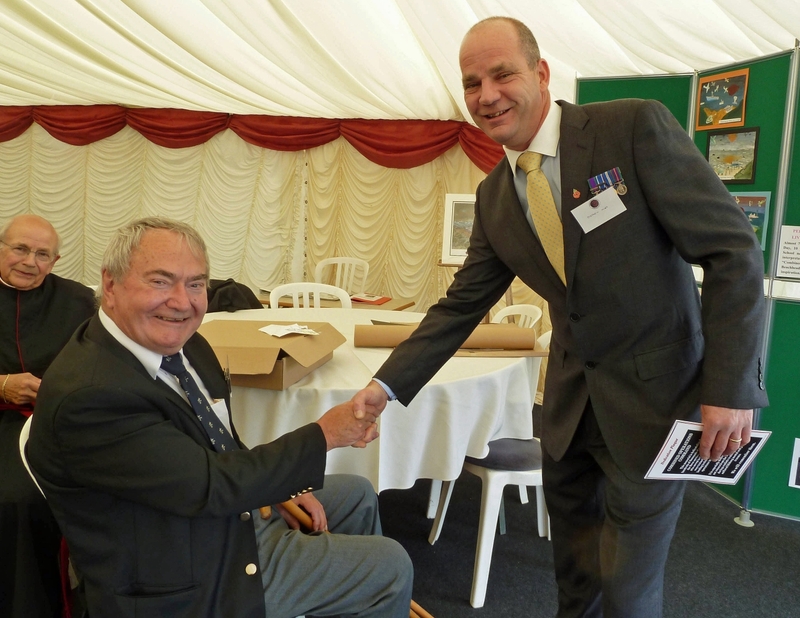 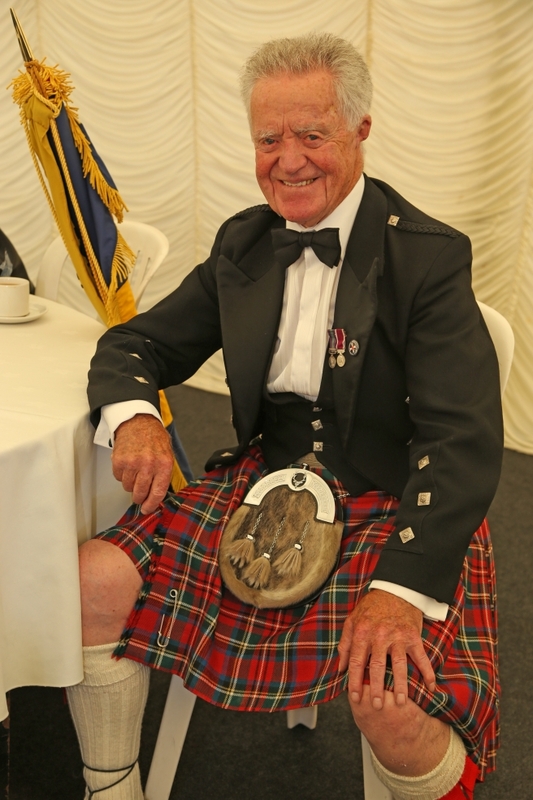 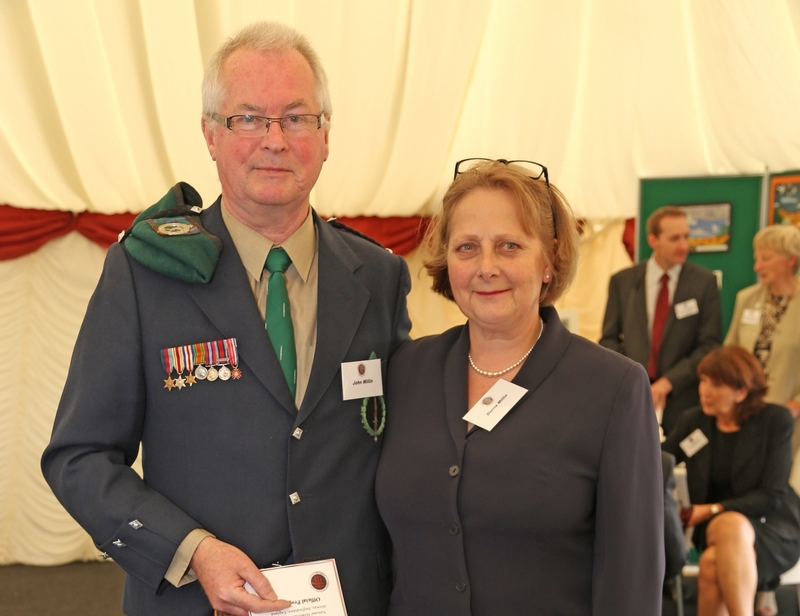 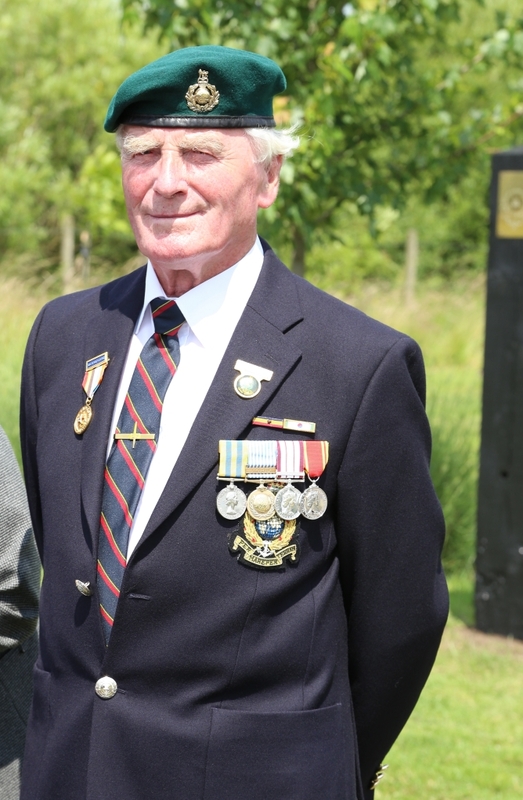 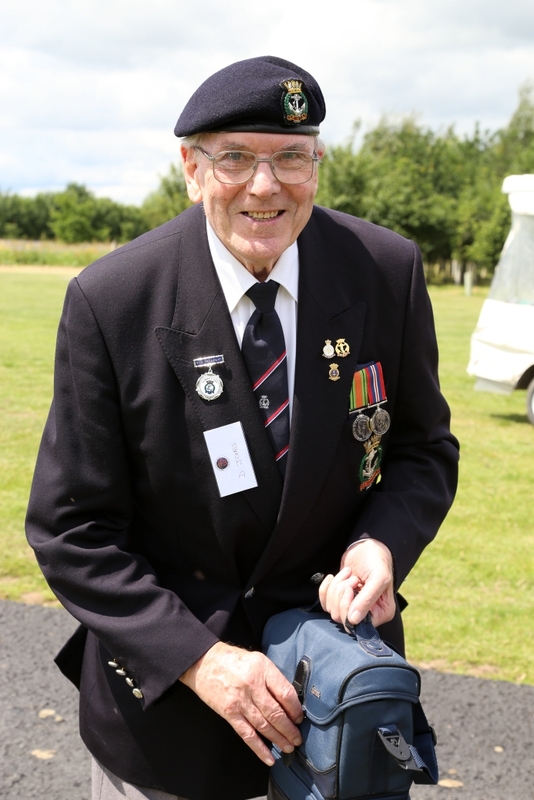 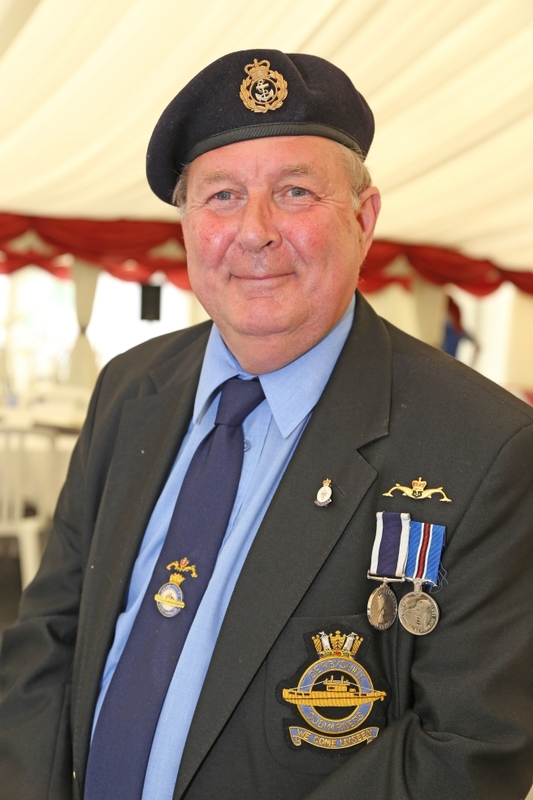 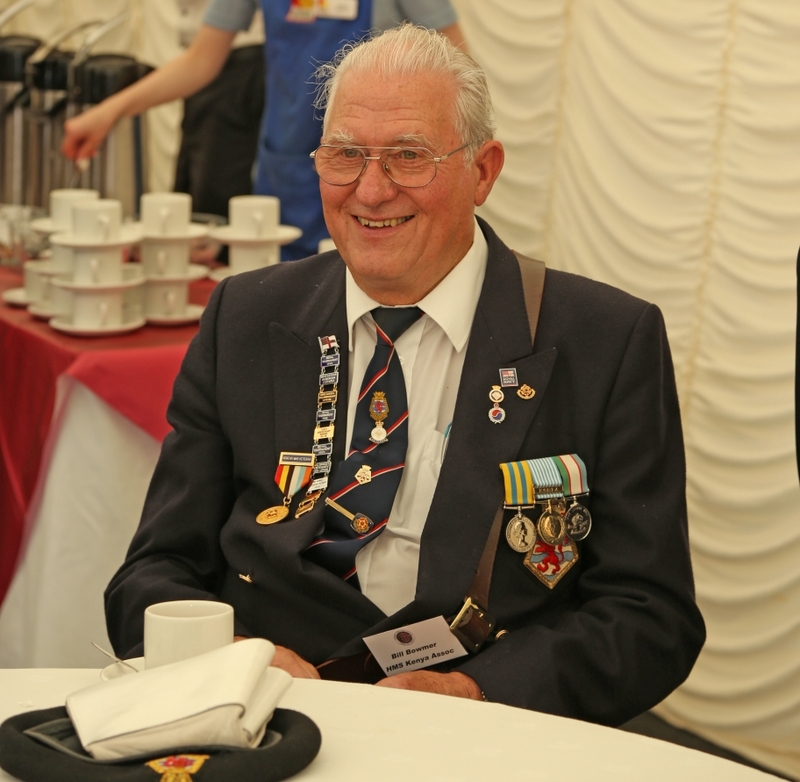 It was John Glen's reminiscences of his service in the Combined Operations Command that planted the seed from which grew the Combined Operations Command website. 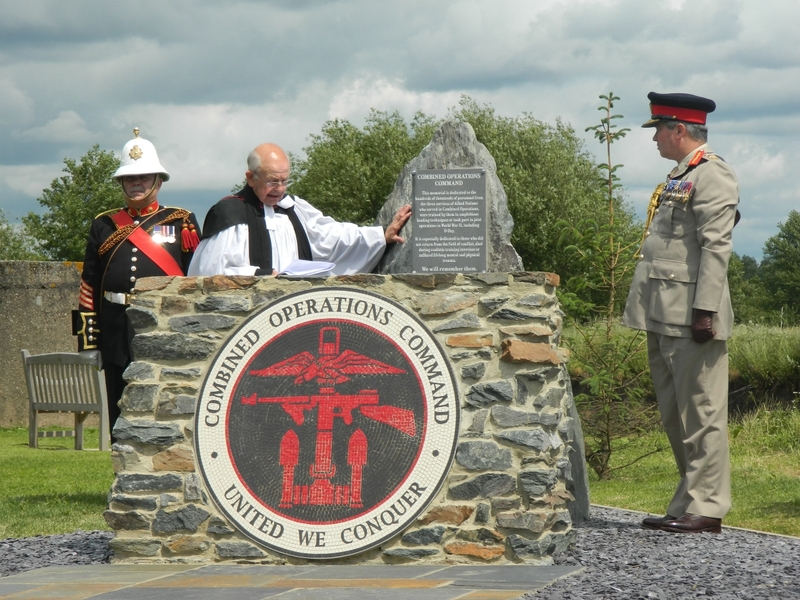 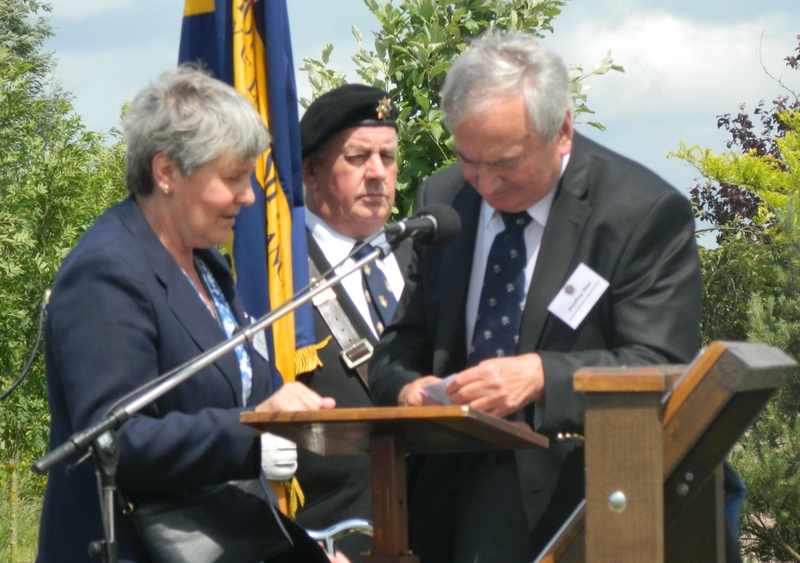 It was first published in 2000 and the Combined Operations Memorial Fund set up in 2005. 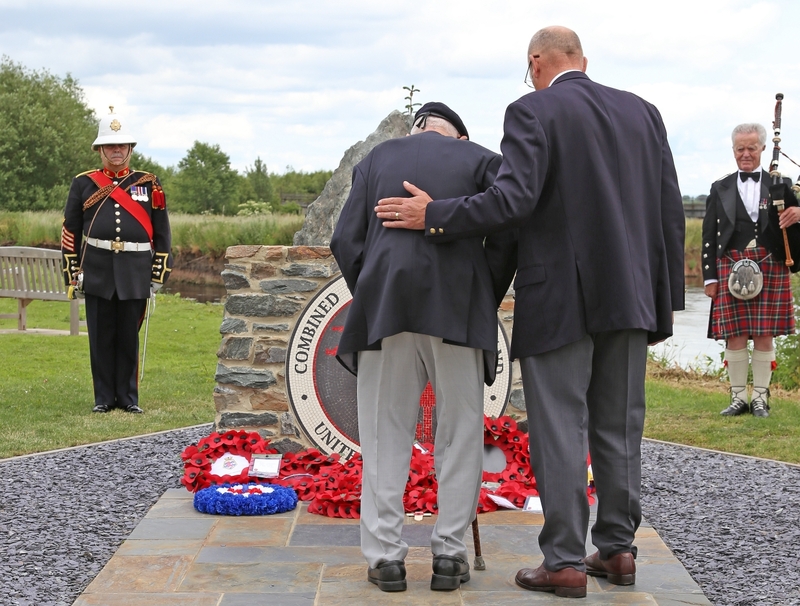 Wreaths and other tributes laid by veterans, their families and friends, provided the most emotional and poignant part of the ceremony. Many a tear was shed as thoughts turned to absent comrades and loved ones. 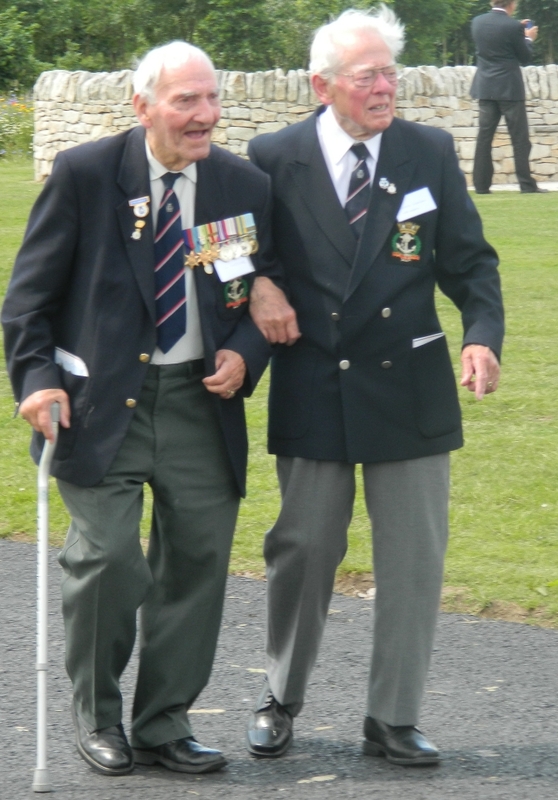 Much courage, determination and dignity was on display that afternoon. 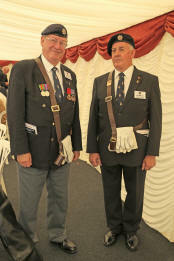 For their help on the day, thanks are due to Brenda Gordon and Elizabeth Hall (reception desk), Ken Hope, Ann Hope, Mike Phillips and Sheila Phillips (marquee reception and name badges), Mike Hall (MC/trouble-shooter), Colin Gillespie (arrangements at the memorial site), David Thorp (VIP greeter), Richard Stimpson (organisation of standard bearers), Harriet Calfo (official photographer) with additional photos by Mike Wright, Pam Wright and Sarah Slee. 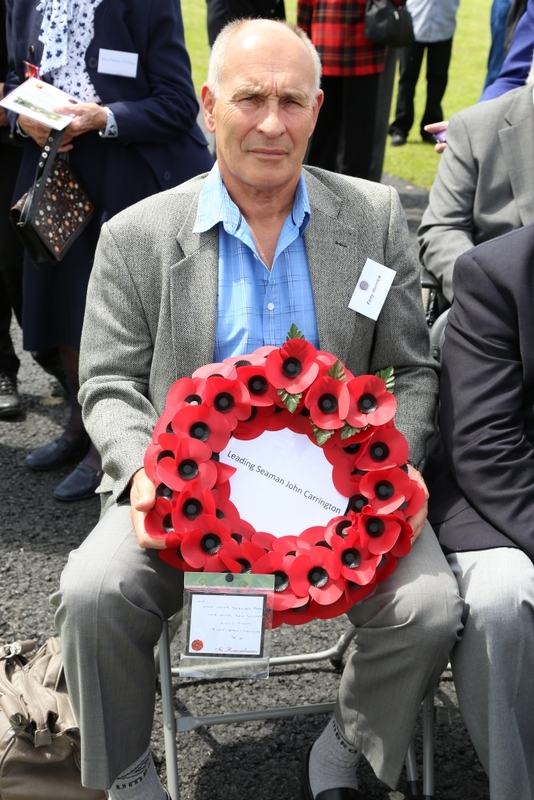 The general factotum was David Slee. 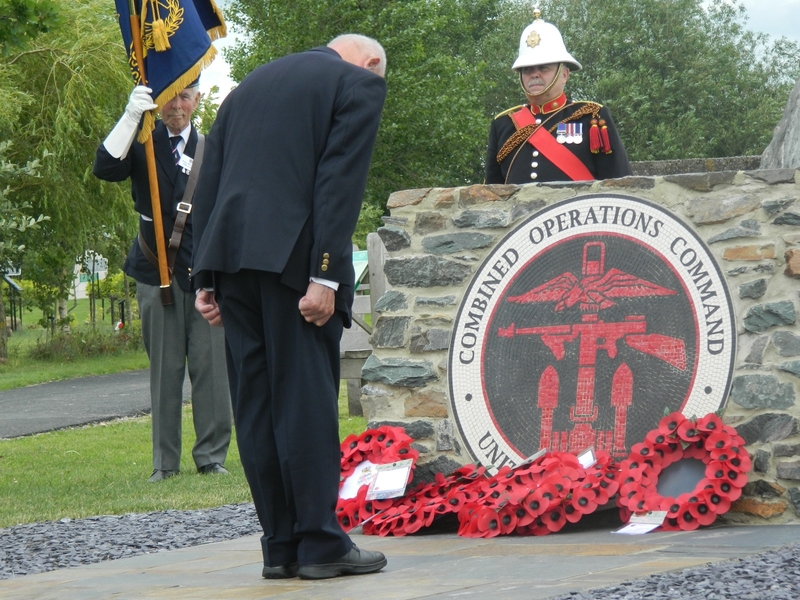 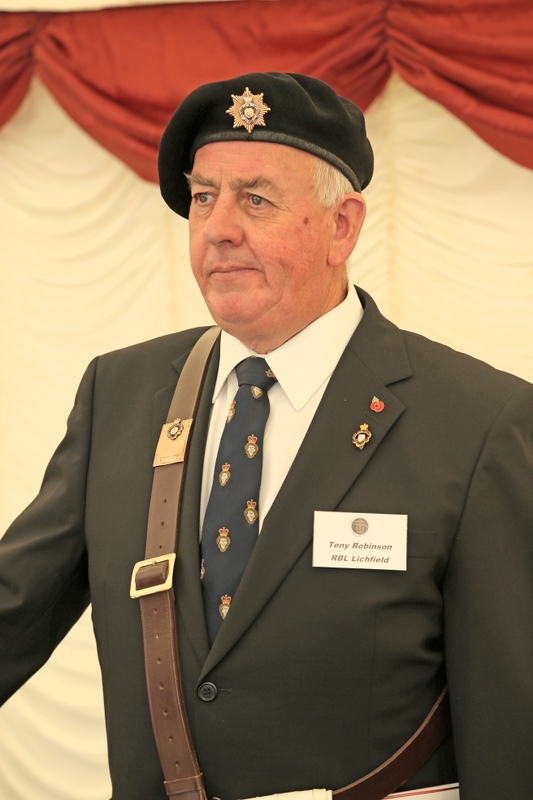 Thanks also to Mike McKenna (Piper), Adrian Harper (Bugler) and the six standard bearers, whose presence greatly honoured and respected all veterans who served in or alongside the Combined Operations Command. Thank you so much for the many e-mail messages, letters, cards and phone calls. 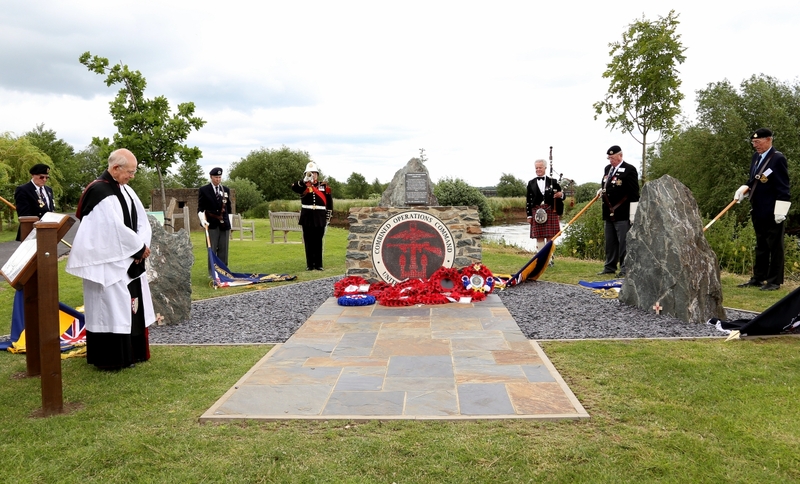 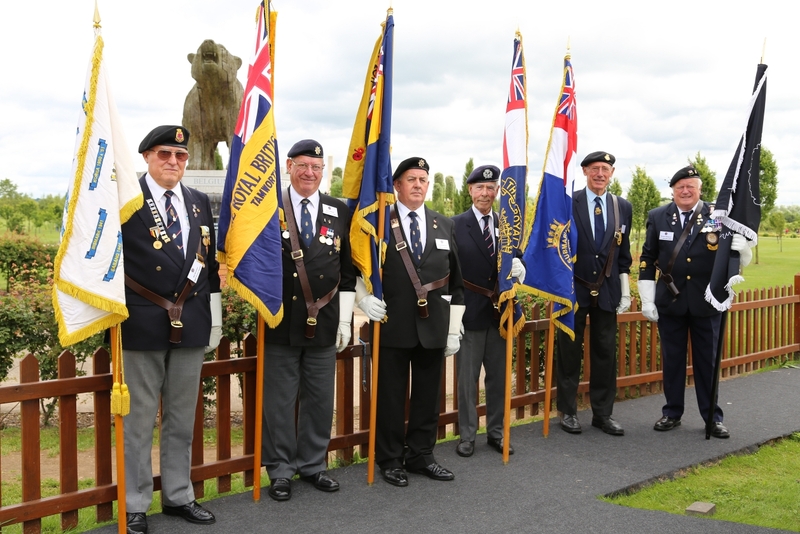 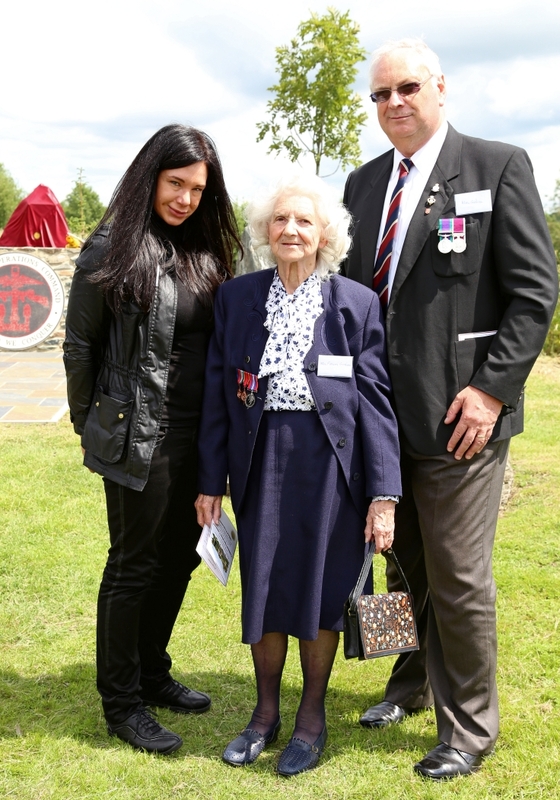 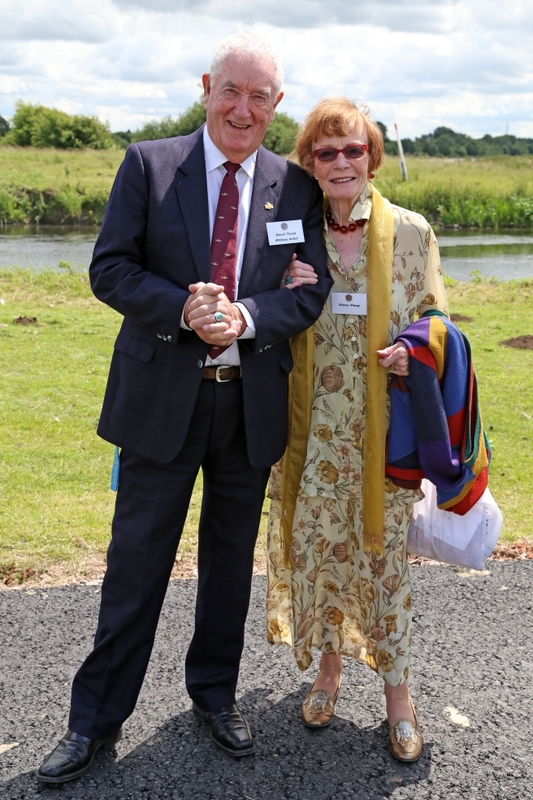 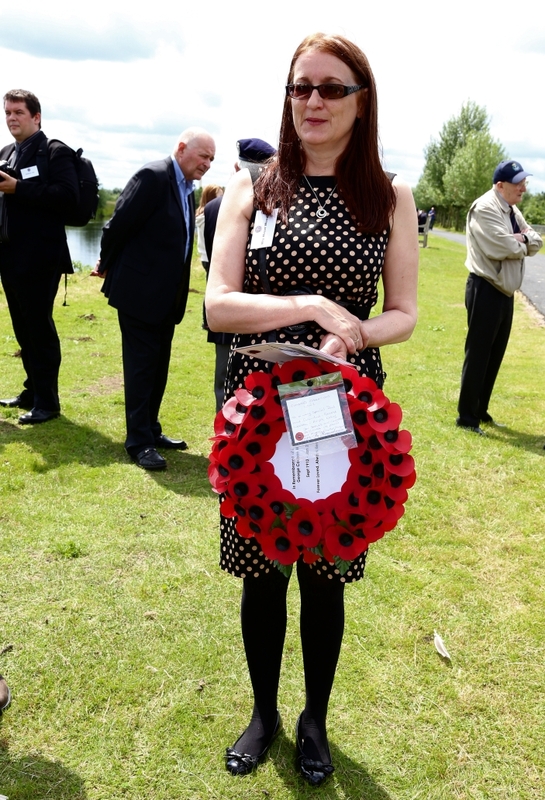 The memorial is in the grounds of the National Memorial Arboretum (NMA) around 27 miles north, north east of Birmingham near the village of Alrewas, Staffordshire. 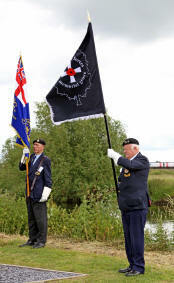 For SatNav use DE13 7AR. 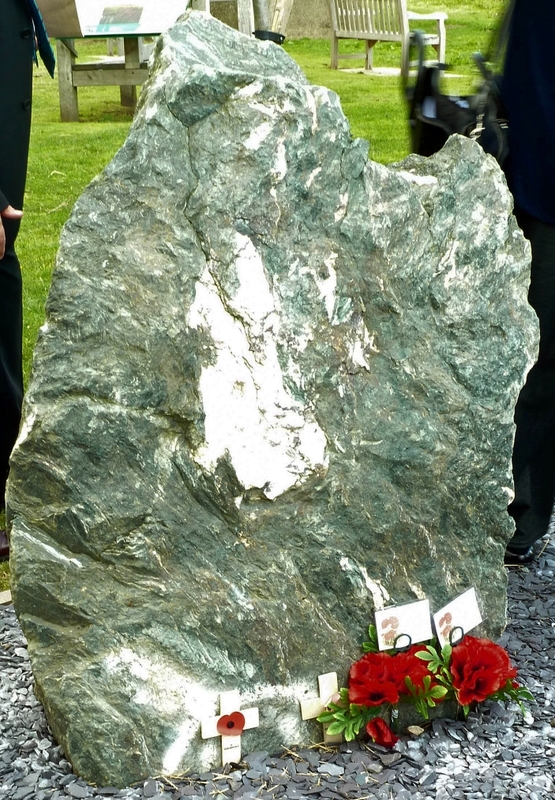 The GPS coordinates are; Lat N 52 43.705 and Long W 1 43.934. 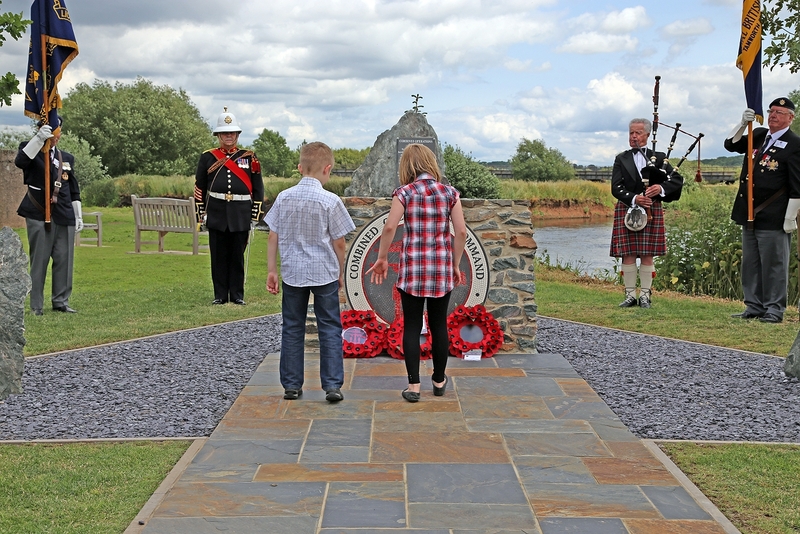 The coordinates of the memorial within the NMA grounds are; Lat N 52 43.866 and Long W 1 43.360. 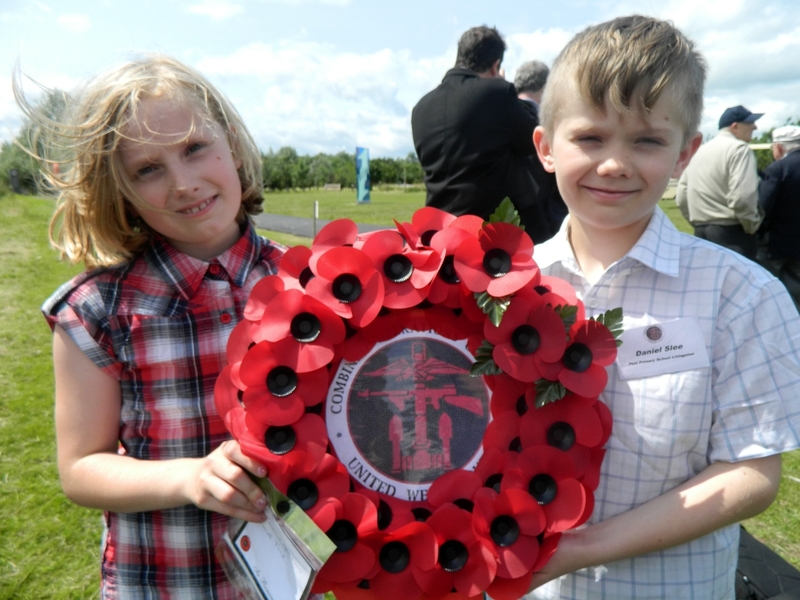 There's more information on planning your visit on this page.